Since the last post in 2017, I basically hibernated for the past 1 and half years. What have I done for the past 1 and half years? I have gone through from having a lovely husband into getting our first baby daughter. 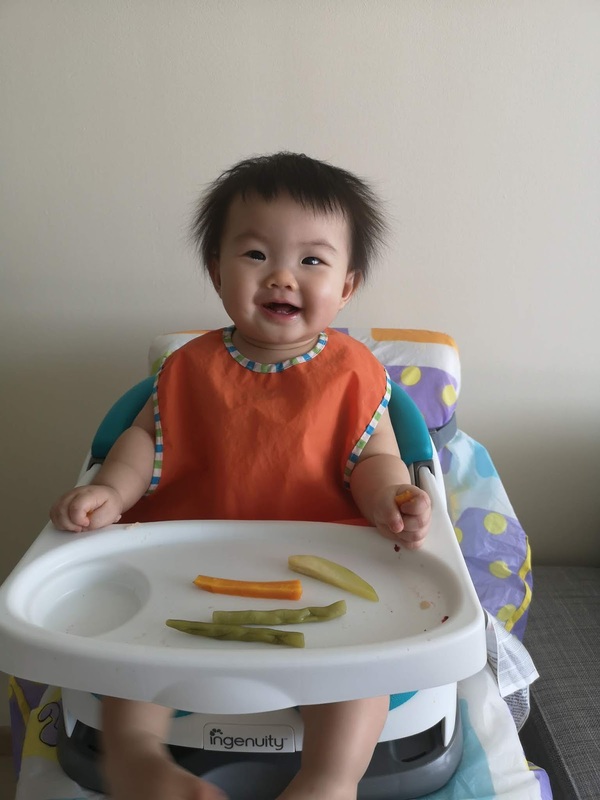 Our baby daughter is 9 months now! Time flies so fast, still remember the day that I carried her in my arm in the labour room, and she is now all grown up, able to crawl and stand on her own. 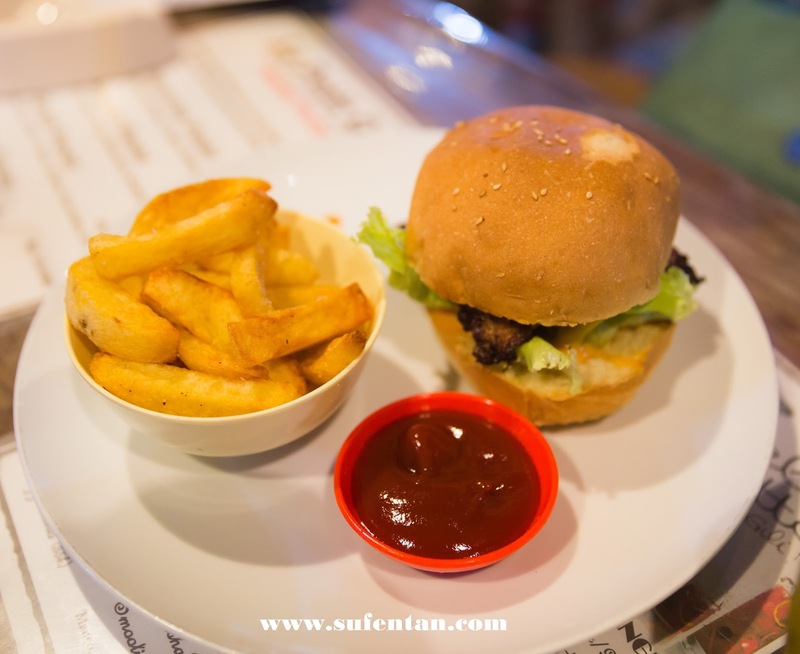 For the next few weeks, I'm going to share my journey of pregnancy, my delivery and baby led weaning process with my baby. It was a bumpy journey during my pregnancy. I was on bed for around 2 weeks when doctor found bleeding during my second month of pregnancy. I vomited from third month, continue until 6th month of pregnancy, worst time is early morning and late at night. Stomach upset everytime I had spicy food but I had the crave everyday. I was admitted to hospital on 41 weeks due to overdue but baby seem to be very comfortable in my tummy after 3 doses of medicine to induce labour. Luckily doctor manage to make it happen for natural delivery! Breastfeeding: Fully Breastfed, still on-going even though baby is 9 months now. Signing out now! Stay Tuned! What to eat in Lombok? 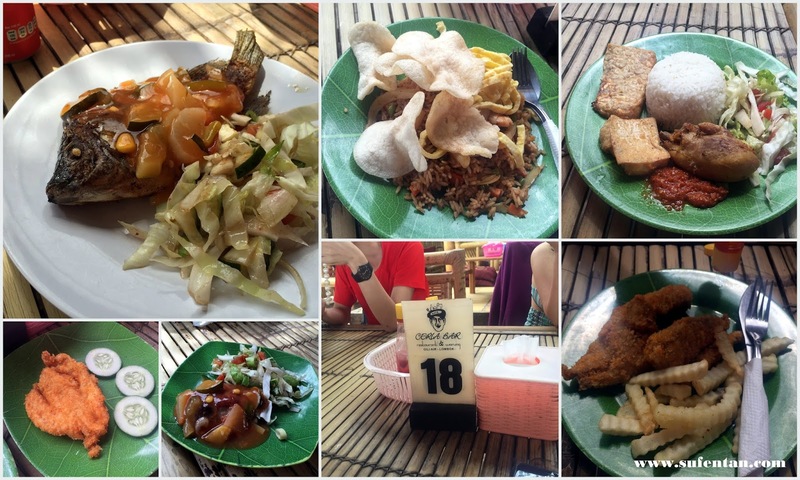 If you have been reading my first post on Lombok trip, I believe you are wondering where is the food review. This tamchiak girl never failed on introducing nice food when travelling. Yes, you are right. Here is the post! 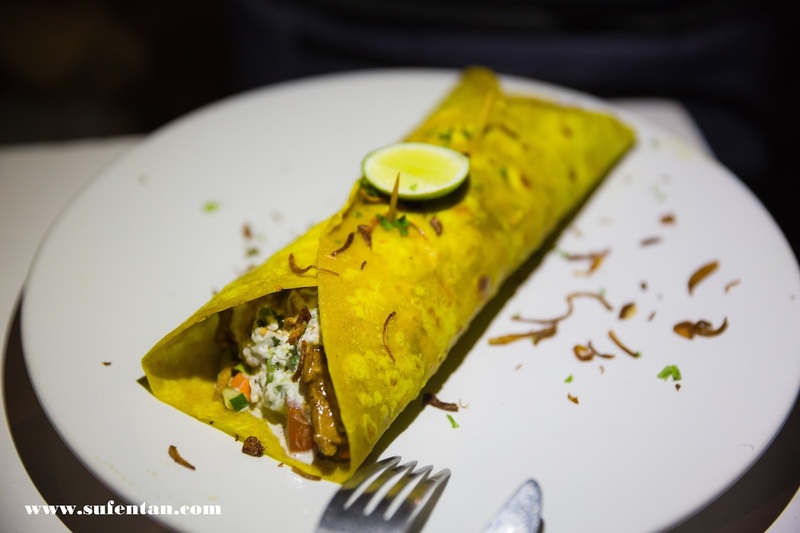 I'm going to review on the food I had during the trip and which are good and bad. 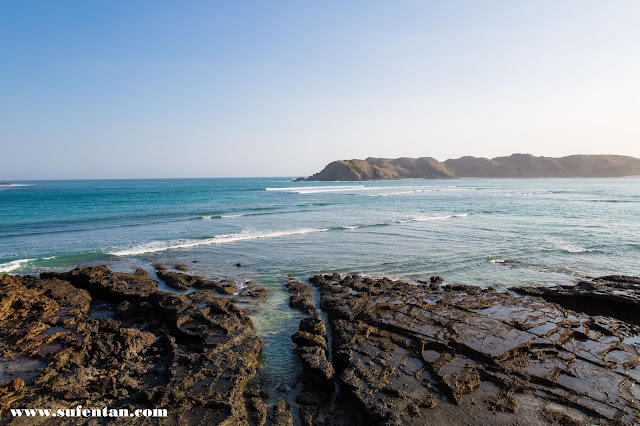 If you missed out the Lombok 4 days 3 nights Itinerary post, you can check it out HERE. This is one of the place that you must visit and it is just opposite the airport right at the round about. 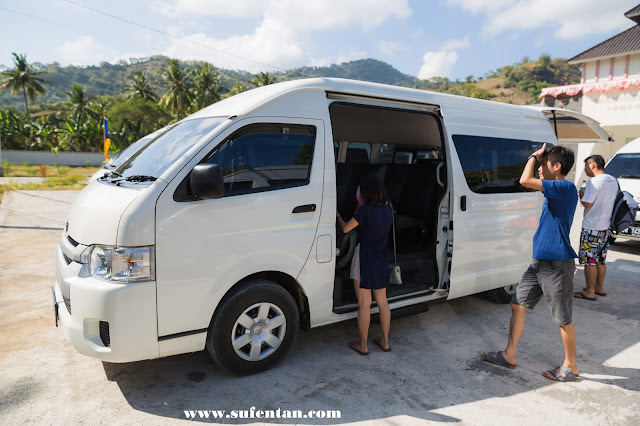 You can ask the driver to drop you here when you reach Lombok from airport or before you leave Lombok to airport. 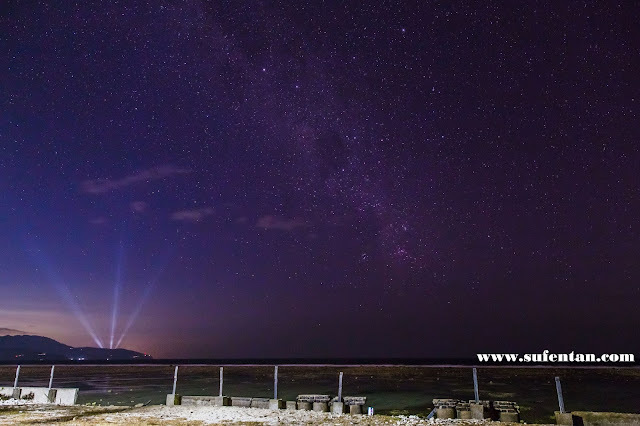 You will not miss this place. During our meal, we see lots of locals and air cabin crew will drop by here. 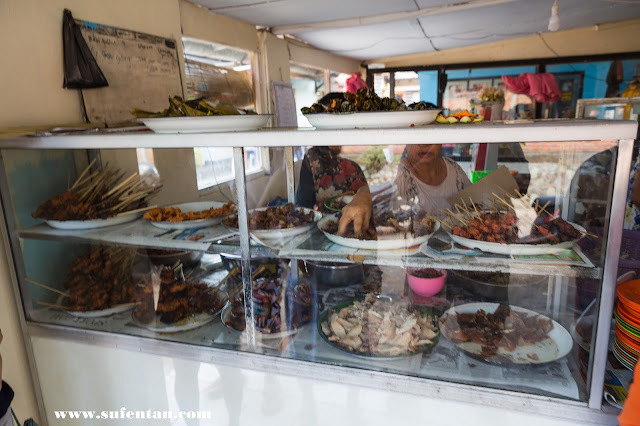 Lombok is famous for its Ayam Taliwang, and this is the place where you can find cheap and good original Ayam Taliwang. 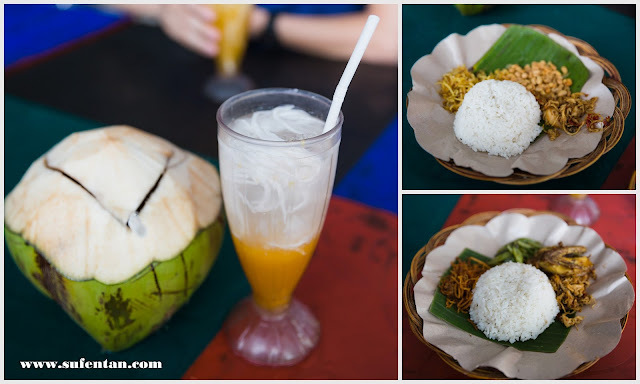 To our surprise the drink name Es Jeruk with Coconut turns out to be one of the best drink we had in Lombok. 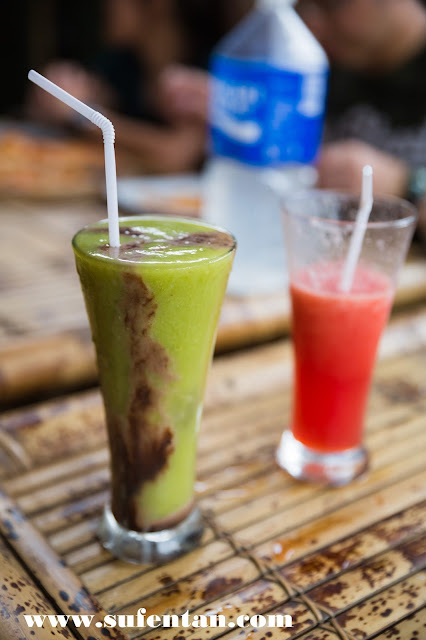 It is a type of orange juice added with coconut juice. 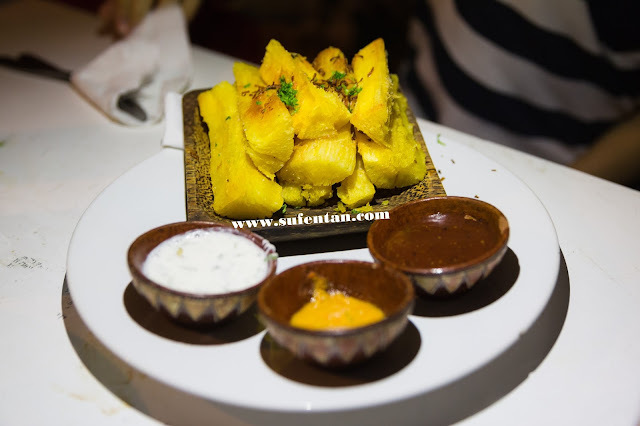 However, be careful of the chilli that comes with the rice, it is super spicy and burning! The second place that you should not miss out. 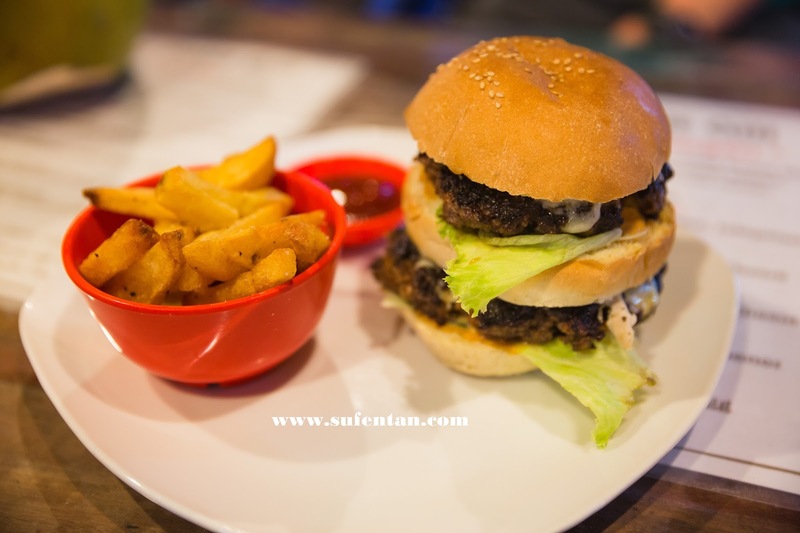 Please note that this is a non-halal place. 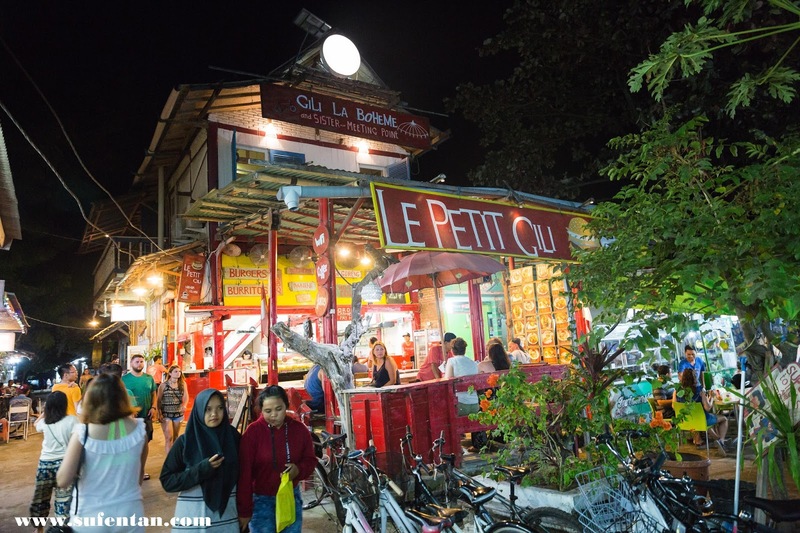 This is one of the famous local stall for its pork dishes. It sells everything from pork skin to pork meat and pork intestines. It is so famous that for the past 1 hour when we were there, the crowd never stopped. It is a small shop that fits not more than 20 pax. Most of the local will take away instead of dine in. It is like a mixed rice shop in Malaysia. But you will need to bear with the heat if you are dining in. 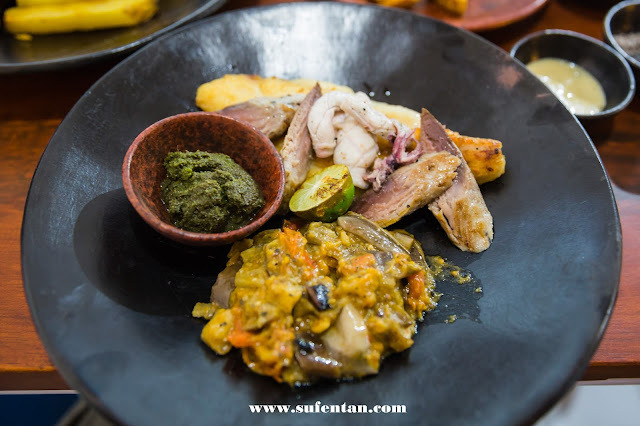 The food are prepared in trays. 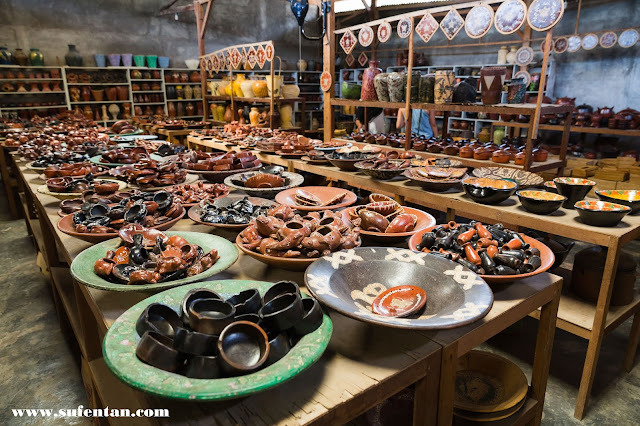 You pick the dishes you want from the counter and they will take from there using their hands. If you are concerned about hygiene, you may want to re-think of visiting here. So far, none of us got food poisoning from this stall. Based of our analysis, each item is charged Rp. 5000 except rice which is foc. The most ridiculous calculation by them are the drinks. All of us order the same Mandarin Orange Juice but was charged at different prices, ranging from Rp. 5K -8K. We ordered 3 rounds and it never came to the same price. Overall, the food is great, the peanut sauce is the real highlight. It is cheap and good! consists of fried tofu, fried pork meat, pork sausage, fried pork satay and grilled pork meat. 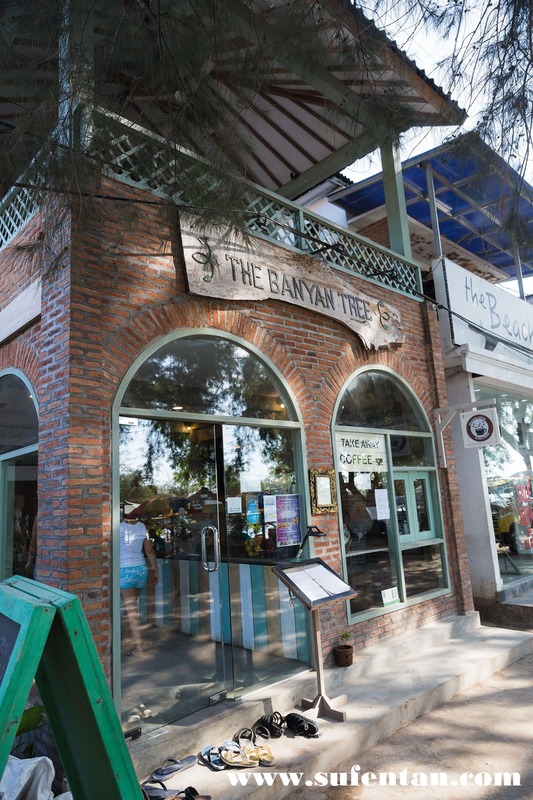 We had dinner here on our first night in the Lombok. A romantic place for couples as the dining area is exactly on the beach, looking out to the sea. We came around dinner time and the place is decorated with nice and dim lighting. This place was one of the recommended places online to dine in in Gili Trawangan, some people said it is the best place to eat. In conclusion, we think the food was not bad but the price was high. It is basically deep fried sweet potatoes. Don't be fooled by the "wedges" word, thinking it is potato wedges. However, the taste was nice. 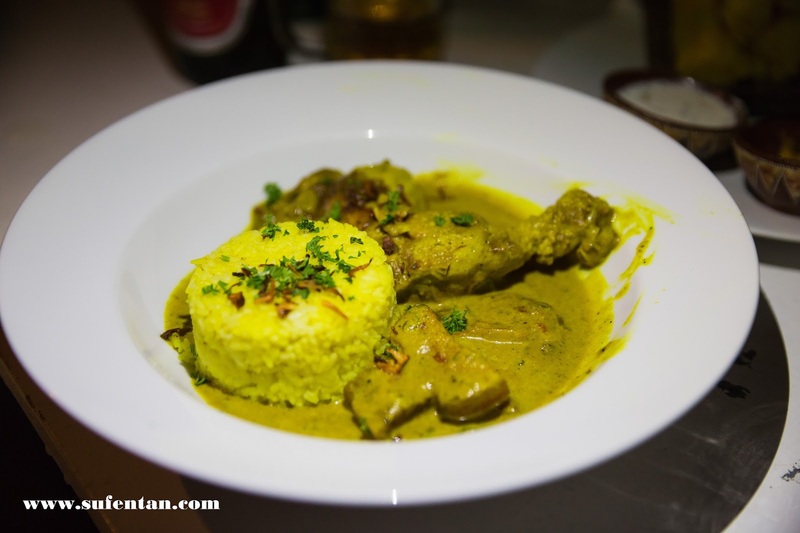 It taste like Indian curry chicken rice, spicy but full of fragrant spices . Actually, we were expecting roast chicken since it was named "oven baked" but we are still fine with curry rice. The size of the chicken is normal, not the tiny ayam taliwang. 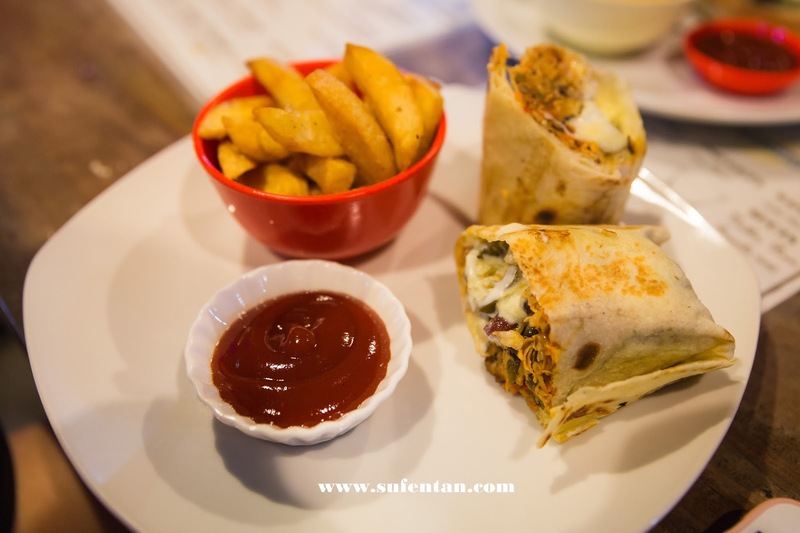 Basically it is similar to the ingredients and taste of the oven baked yellow chicken, except they wrapped it in a Tortilla bread. The portion is big. Oven-baked chicken again but this time with roasted veggies and rice. Taste wise is quite similar to the yellow chicken, the spices is stronger. Jamaican spiced vegan stew with beans and dumpling. 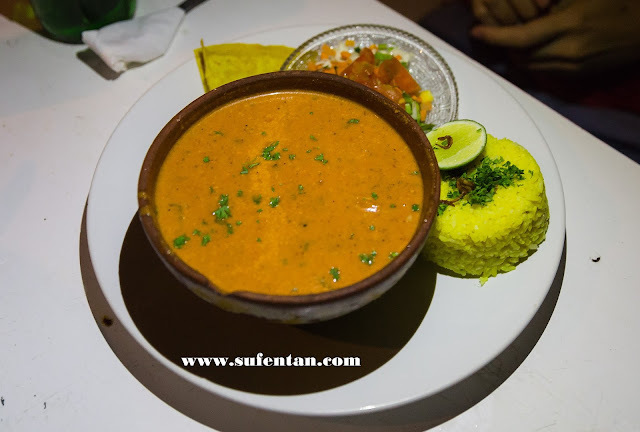 We do not really know what is this but it is more like vegetarian curry with rice and tortilla chips, nevertheless it does taste quite good. 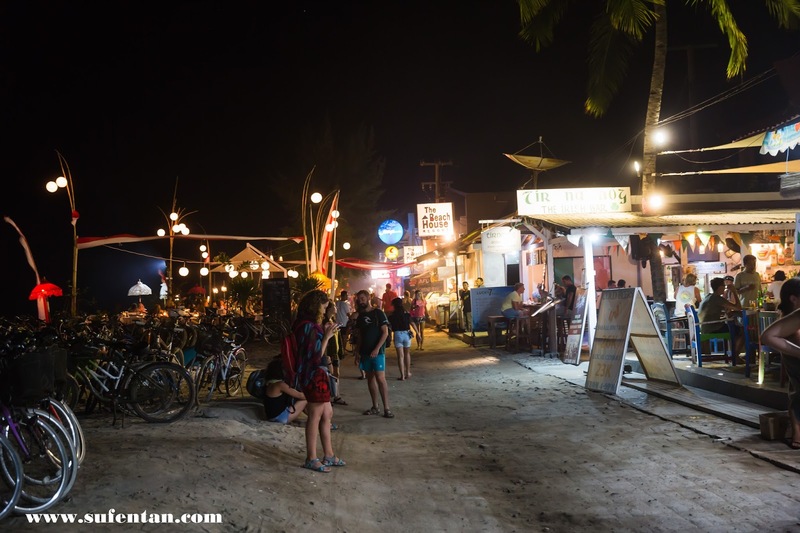 On our second night in Gili Trawangan, we headed for some burgers. We found this place rated to be one of the top rated restaurant in Gili Trawangan. It is just beside the night market.They served western food like burgers, paninis, hot dog, burritos and even local food. 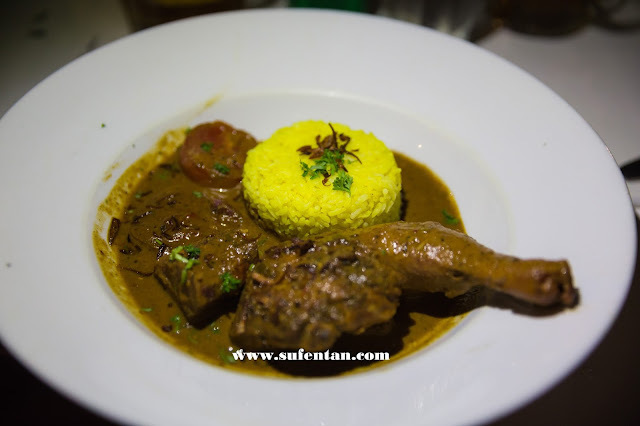 The taste was not bad, the portion is just average but service is quite fast. This place is not halal as we asked about the ham, it is pork. Texture is like the pulled pork burger, overall was nice. It is a Vegetarian restaurant that we found when passing by at night. I actually liked the place, nice and cozy. Their menu are quite unique and food was good. It opens from 7am-8pm daily. We came here for breakfast since I don't quite like the guesthouse's breakfast. No regret of coming here though the price is on the high side. Scrambled tofu mixed with wild mushroom, onion & tomato, served with toast. Tasty scrambled tofu, I think it will be better if it is served with rice! 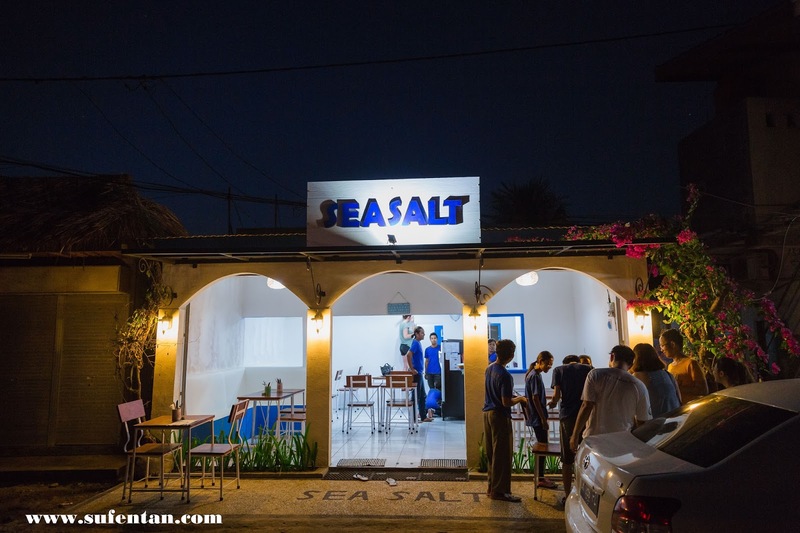 But it was a little on the salty side. 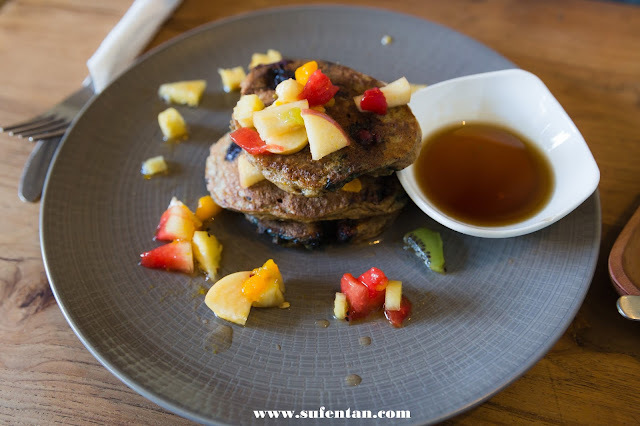 Lovely texture and nice pancake, maple syrup is not too sweet as well. This is a newly opened restaurant, in coincidence we visited the place during their soft opening. It was opened by a Swiss owner, however the chef was not around that day. There weren't any guests during our visit, I guess it was still new. Since we love trying new food, this quickly became our choice for dinner. 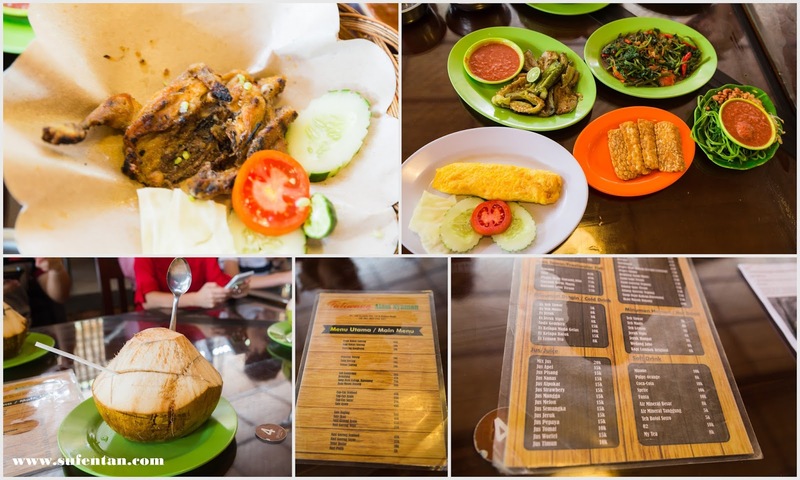 There aren't a lot of choices in the menu, around 6 types of main dishes since it is only the soft opening. I guess they will extend their menu after the grand opening. Overall the food were nice. Just take note when ordering the seafood grill, we found that the squids that were served on that day weren't fresh. My husband and one of my friend's husband had bad diarrhoea the next day. 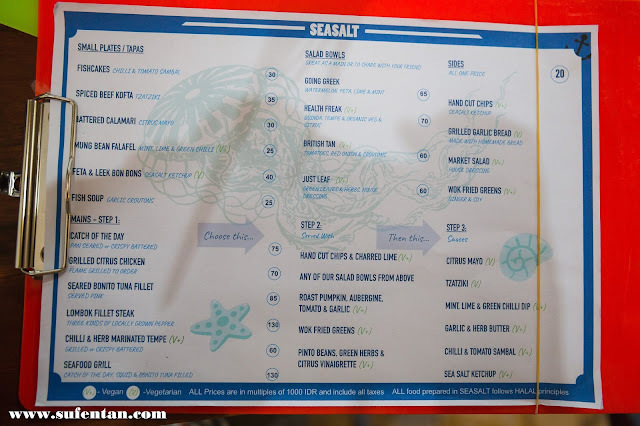 The menu is quite special where it shows the steps for you to order. First, you choose your main either, fish, chicken or seafood. Second, you pick one side. Lastly, you can pick one sauce to go with your main. 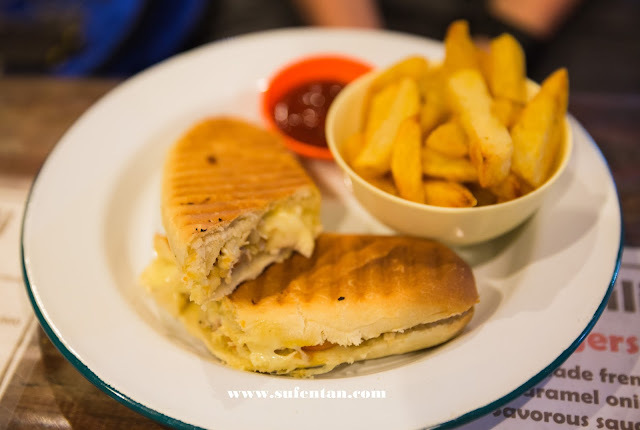 Besides that, you can still add side dishes like chips, bread and salad with additional of Rp 20K. I recommend to not order chicken when in Lombok as all their chicken dishes always come in super small portions. 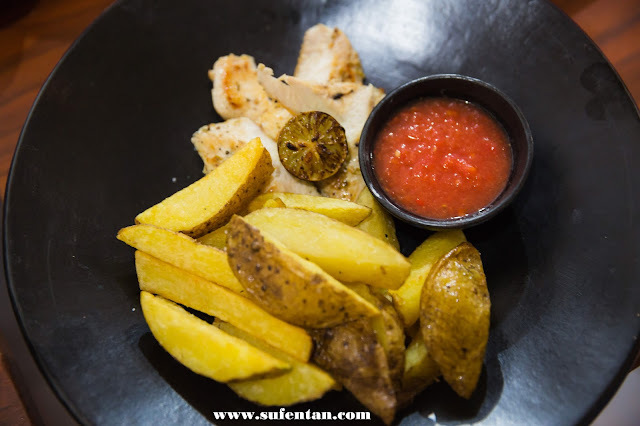 Looking at the above photo, it is only 5 tiny pieces of chicken breast served. Barely enough for appetizer. Taste wise, I like the side - roasted pumpkin the most. 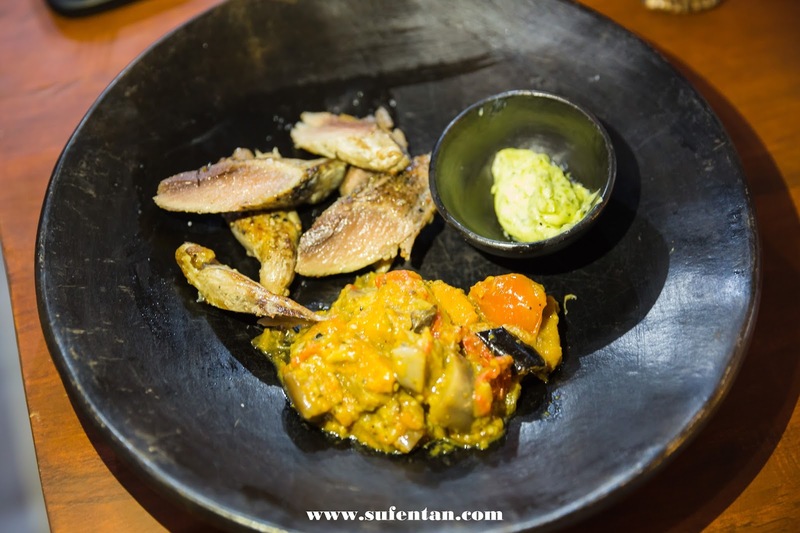 The seafood grill came with the catch of the day, squid and bonito tuna fillet. The food was ok except for the squid which was not fresh. The portion was not as big as we imagined too. This is the biggest portion we ordered. The crispy battered catch of the day, basically is what we call the Fish & Chips. I guess this is the "wont go wrong" dish. 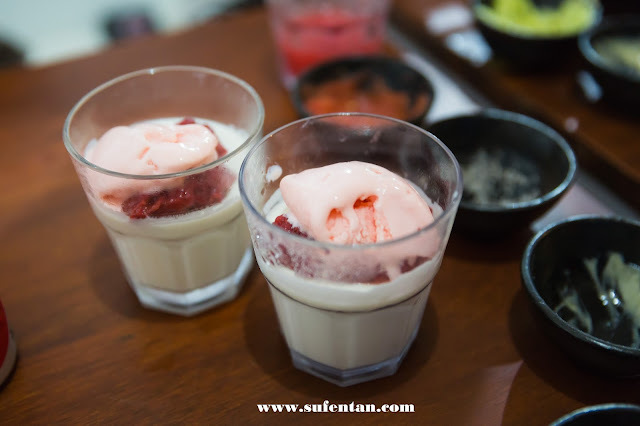 Strawberry coulis with coconut ice-cream. Very special combination. We had our brunch here before we depart to airport. 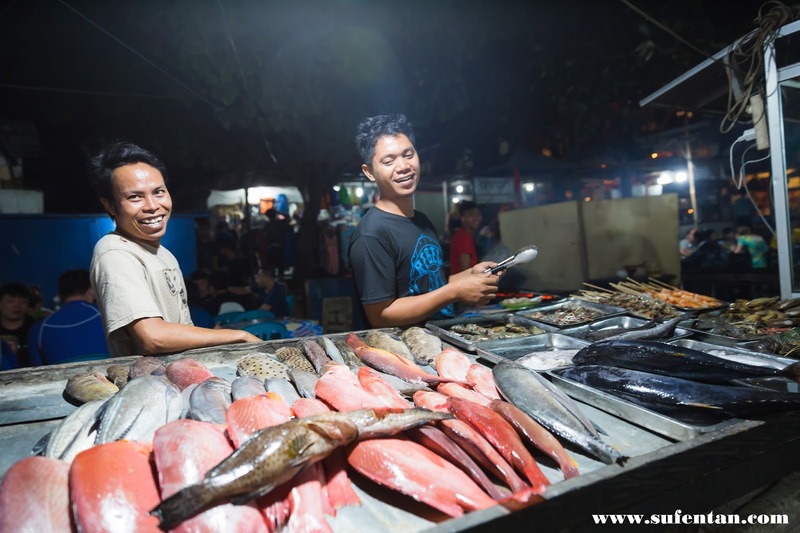 It is located at the shopping road of the Kuta beach where you can see many stalls selling souvenirs and clothes. We picked this place because it was the only food outlet full of people compared to other outlets. I guess the more people the place has, the better the food is, so we followed the crowd. 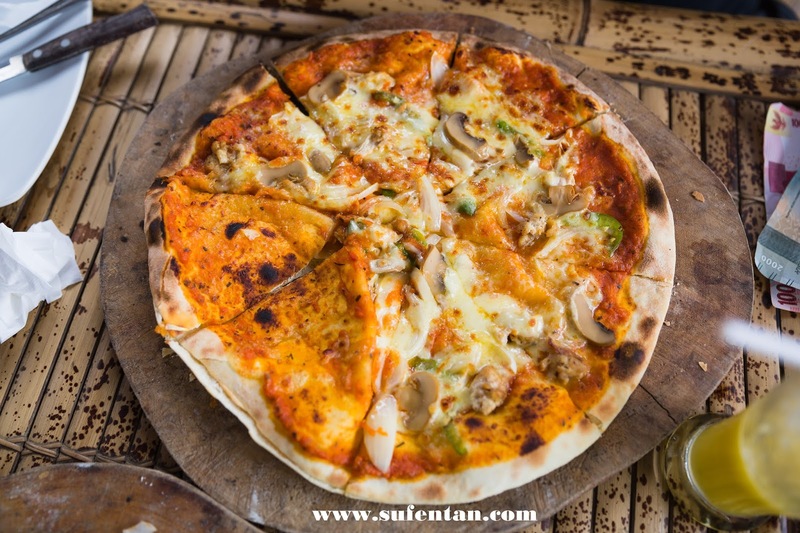 It advertised Wood Fire Oven Pizza on their signboards, trust me you do not want to try any dish other than their Pizza. 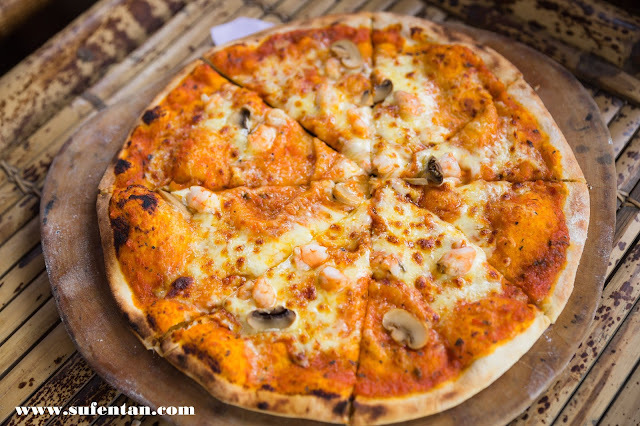 And it is true, their Pizza is the nicest food than other local delights. 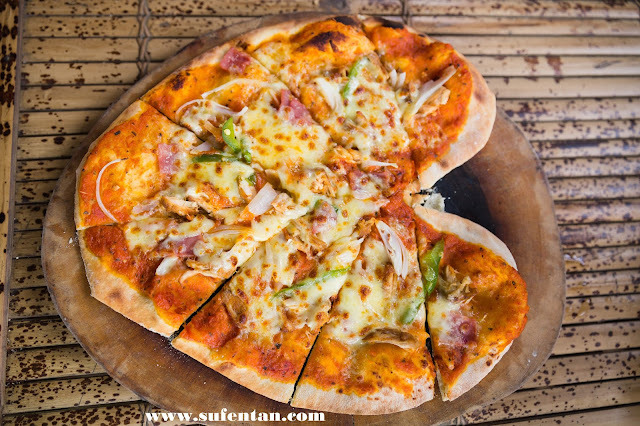 If you ask what is the difference between the three pizzas, we can only say it is the ingredients. The sauce is the same and they all actually taste the same. The pizza crust is the thin type, it smells really good when it was baking. Overall was good and if you are medium eater, you can actually finish one pizza by yourself. Taste is the same, just the shape of the pizza is love. I was craving for tom yum and spicy food that day, therefore I order a tom yum soup. 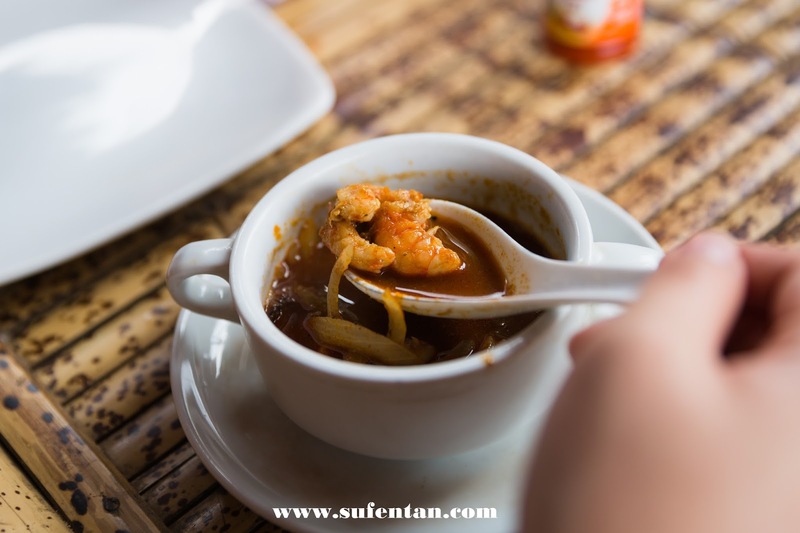 Regretted as it doesn't taste like tom yum at all but more like the Malay spice soup with chilli. Don't even think of ordering it when you are here. 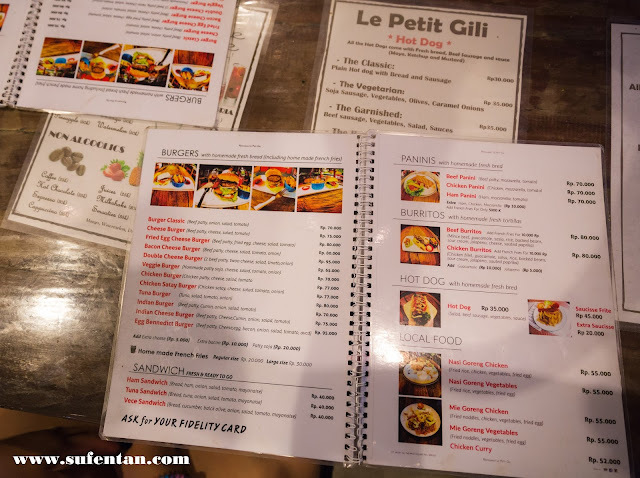 Indonesia is famous for it Ibumie Goreng, so we were thinking it should be nice if we order their Mee Goreng. But it turned out to be quite disappointing. 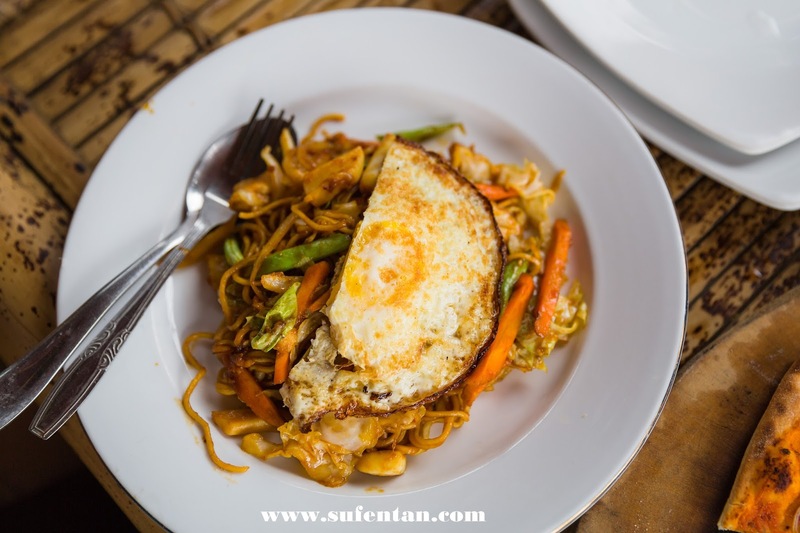 The mee goreng is wet and sweet, quite similar like using tomato sauce to cook the noodles. Not sure what is the name but it taste like fried ice-cream. Quite nice but a bit too sweet. I wouldn't recommend to come here as the food is just so so and the price is very high. If any driver try to push you on this restaurant, reject them immediately. I saw the guests are mostly tourists that dine in here. Their famous chicken dish is the size of a lady's palm. It comes with different sauces- normal, spicy and honey. However, the chicken was dry and barely had any flesh. 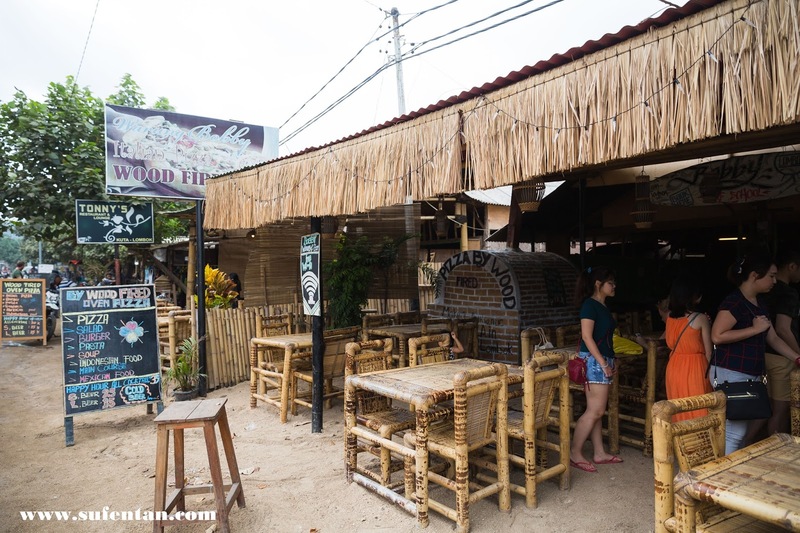 We did not had the chance to pick which restaurant to have our lunch in Gili Air as our guide parked their boat in front of this restaurant. For every boat that parks in front of the restaurant, the guide will have to ensure their guests dine in there. If you already have in mind the restaurant you want to dine in, tell your boat captain and they will bring you there. 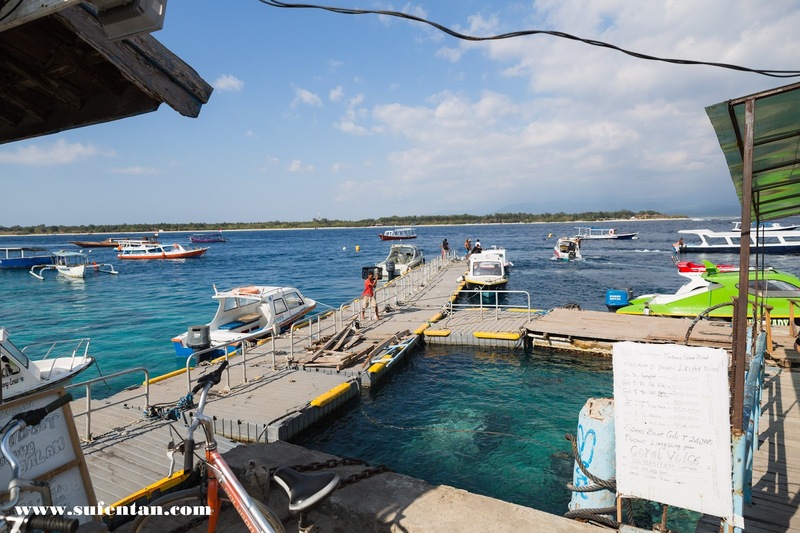 All boats will stop at Gili Air for lunch. 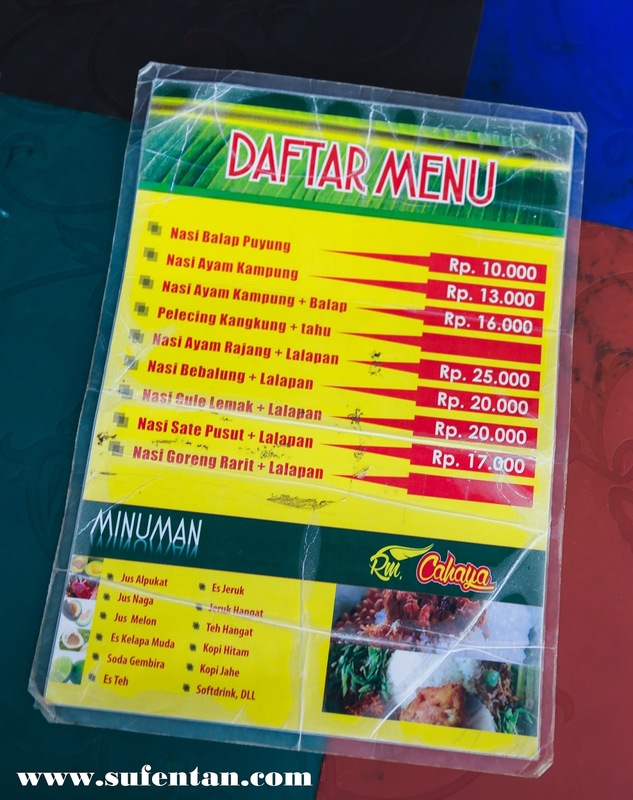 The food was cold and tasteless, price wise is around Rp 40K and above. Lombok, an indonesian island that is located near the east of Bali. It is around 2 hours journey by fast boat from Bali to Lombok. You may also fly from Kuala Lumpur to Lombok directly with AirAsia. This round, I travelled to Lombok with 5 of my friends, a total of 7 of us...yes an odd number but I feel it is still ok to travel with 6-8 persons in a trip. It is easy to manage and we're able to travel around with a van at a reasonable price. We took AirAsia as it is the only direct flight from Kuala Lumpur to Lombok. I would recommend to take the earliest flight and reach there around noon. 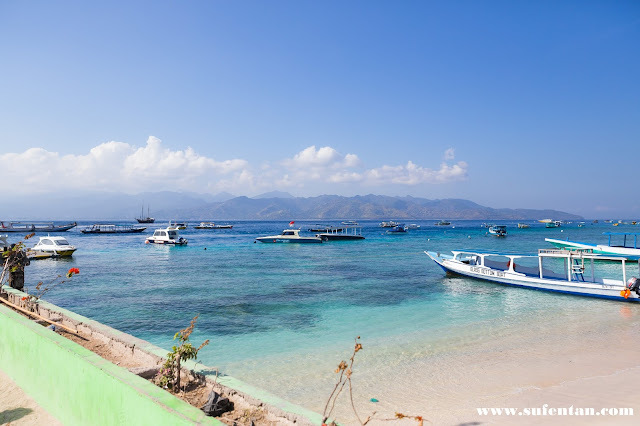 As you will need to travel around 1 hour from airport to jetty if you are planning to stay in Gili island. 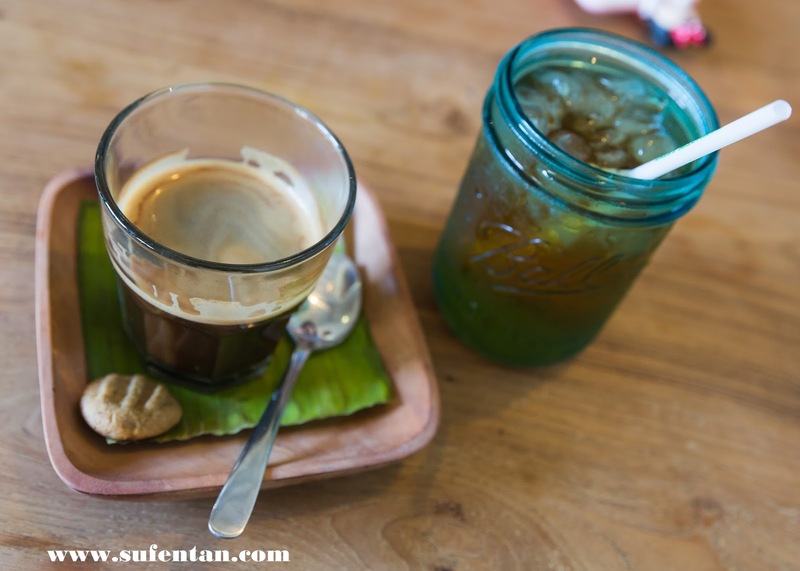 If you are taking the afternoon flight, I would recommend to stay at Kuta or Sengigi for a night before travelling to gili island the next morning. Travelling from the jetty to gili island in the evening can be quite dangerous as it starts to get dark around 6.30pm. Where to stay/visit in Lombok? 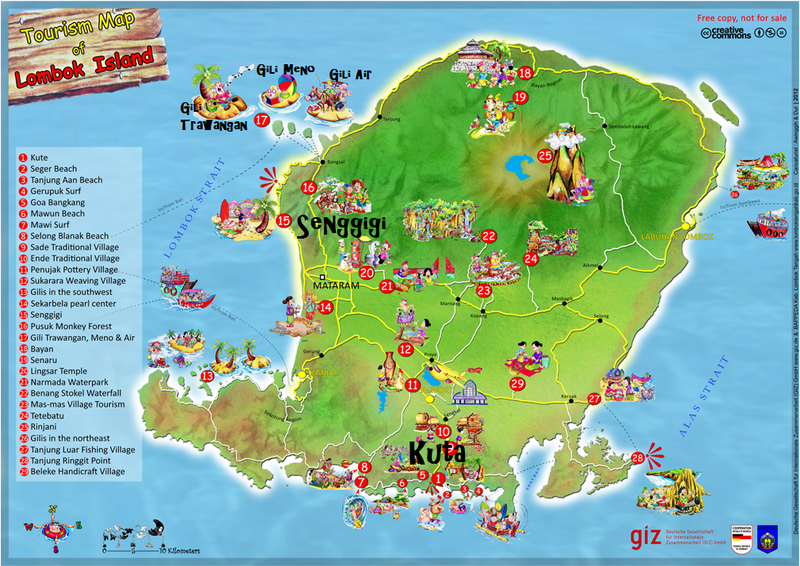 I summarised into 3 places- The Gili Islands, Senggigi and Kuta, These are the favourite places to stay for tourists. 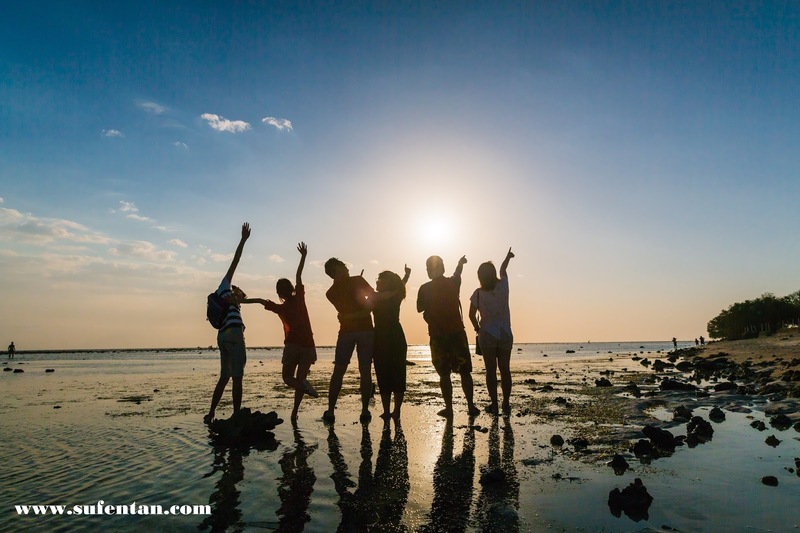 During our 4 days 3 nights trip, we stay in Gili Trawangan and Kuta. We picked Gili Trawagan because it is the most happening island compared to Gili Meno & Gili Air. On the last night, we stayed in Kuta because it is near to airport, around 30 mins drive. There a are few ways to travel to Lombok. 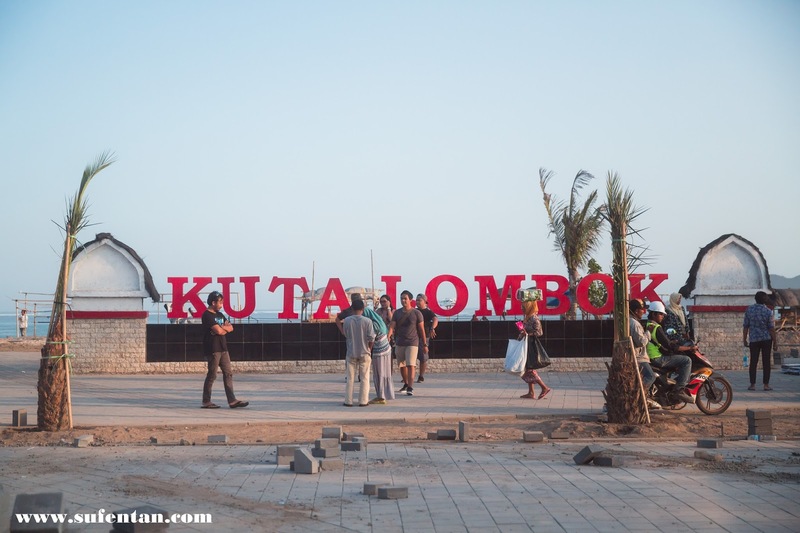 You may take directly flight from Kuala Lumpur to Lombok by Airasia. If you have additional days to spend while travelling in Bali, you may take fast boat or flight to Lombok. Fast boat will take around 2 hours - 2 and half hours journey while flight will take around 30 mins. You may charter a van to travel around or get a taxi. 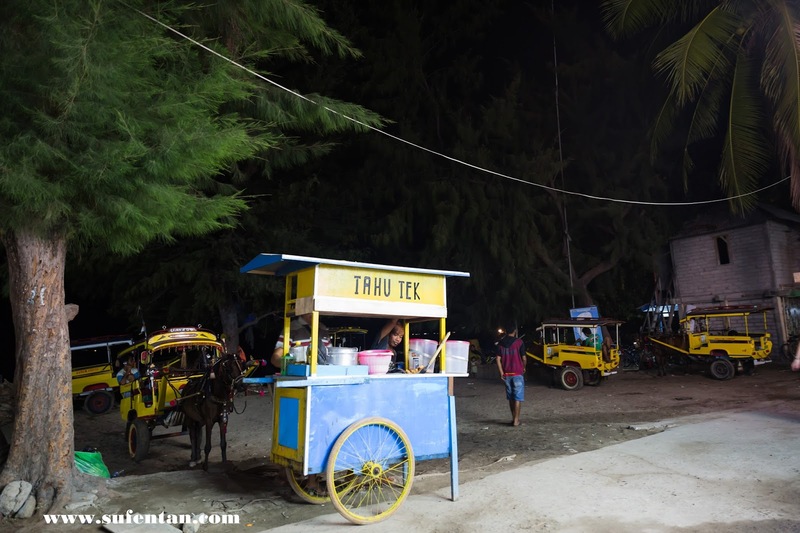 However, I found that taxis are quite rare in Kuta, you would mostly find rented vans only. Negotiation skills will be needed to avoid getting slashed. 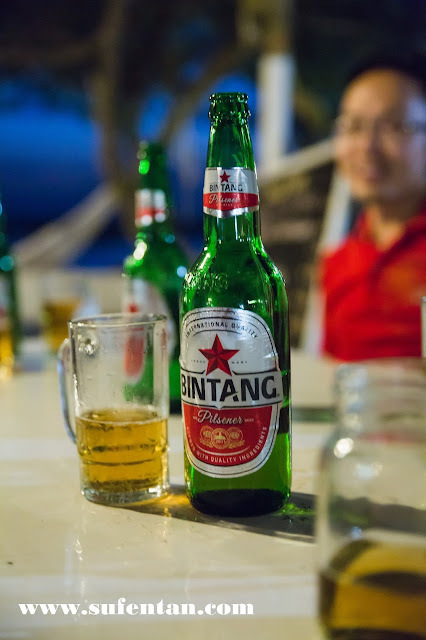 To travel to Gili Islands, you can either use the public boat from Bangsal Harbour or private speed boat (depart from different harbours). Public boat will cost around IDR 15k, takes around 2 hours, but it will only depart when the boat is full. 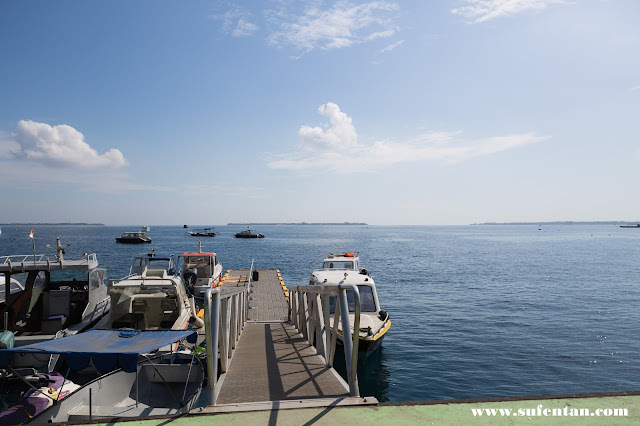 For private boats, it will cost around IDR 600- 800k depending on your negotiation skills. 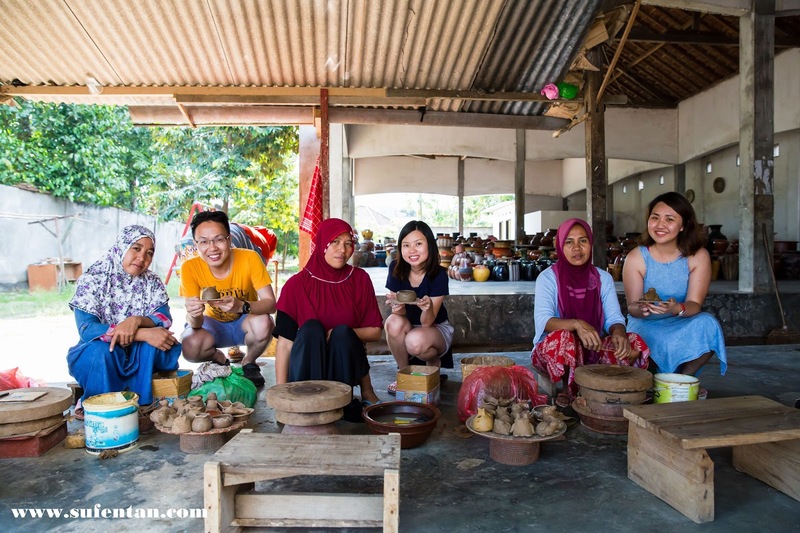 We manage to get around IDR 600k (total of 7 pax) from our accommodation. 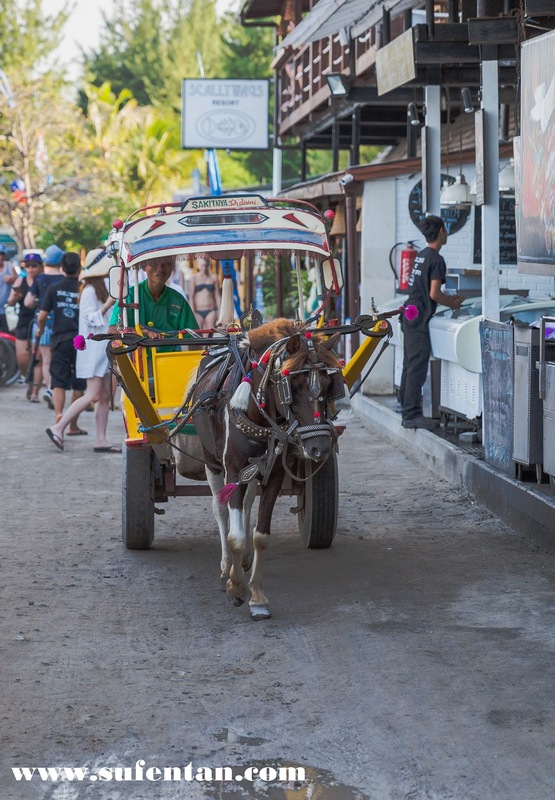 In Gili islands, basically you only have three transportation modes, one is to rent a bicycle, second is getting a horse cart ride (more like a pony ride) and third is by your own two feet. No cars are allowed in the island to save the island from getting polluted. There are many tours offered online. I actually booked an airport transfer and South Lombok tour with a tour guide name Eko. He was one of the recommended tour guides in tripadvisor. He does not have any website but you can contact him through watsapp or email. 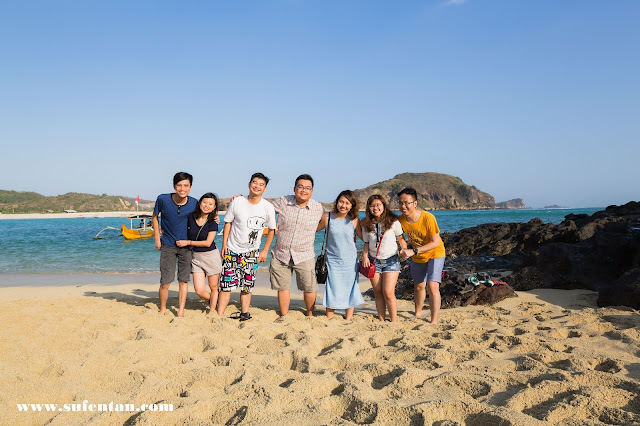 However having said that, I would recommend to get tour packages only after you reach Lombok. They are many tour agencies in Lombok that offer lower prices than what I saw online. As long as you have good negotiation skills, anything can be discounted in Lombok, including accommodation. Places for food: Check out HERE ! We were shocked when we first step onto the island. 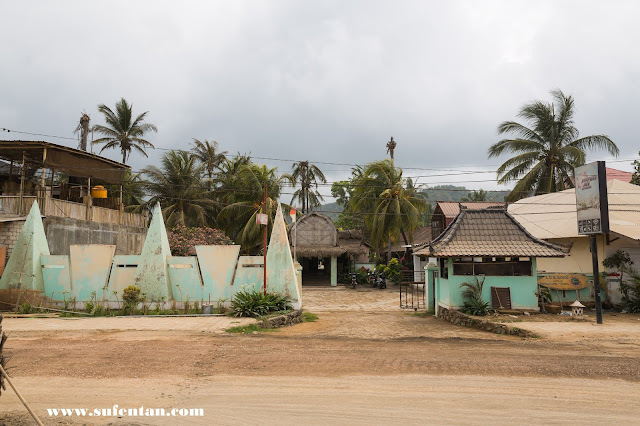 We never expect the island to be packed with people and the road was muddy with horse poop everywhere. It wasn't as beautiful as we thought it would be. Horse riding or more like pony riding is everywhere in the island. They are the "taxis" and I feel quite sorry for those ponies. They hardly have any rest and need to carry heavy loads on the islands. As such, we walked ourselves to explore the island. We paid around Rp. 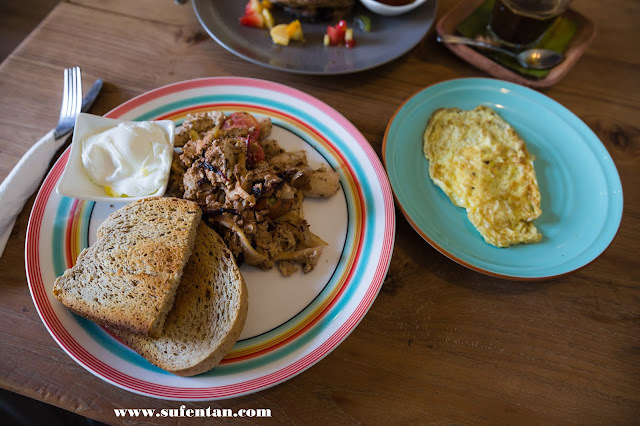 350k (approximately RM 113) per night for the double room with a simple breakfast (omelette and bread/ pancake). It is cheap but the place was quite run down comparing to the photos we saw in Booking.com. 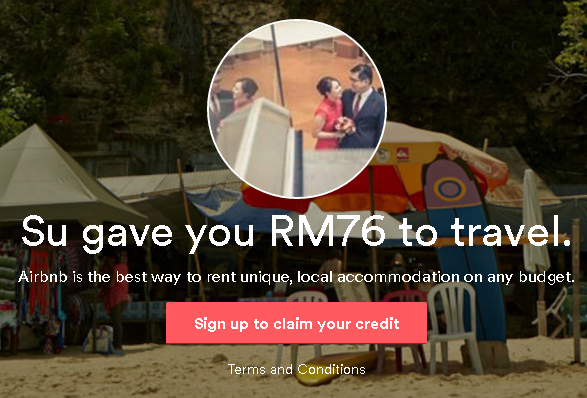 We booked from booking.com but payment was collected in cash on the spot after check in. Comparing to Bangkok hotels around that price, Bangkok is far more better in terms of cleanliness and maintenance. I would recommend to spend a bit more on the accommodation. Anyway, the bed provided is spring bed, I can hear the spring sounds every time I turn my back and there is no hot water. After checking in, we went out to the street to find a good deal for next day's snorkelling trip. 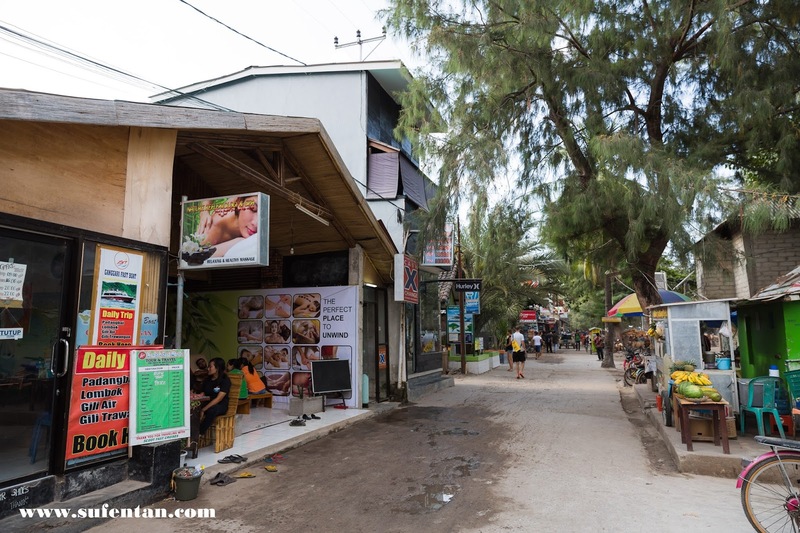 The whole main street of Gili T. are mostly full of shops/stalls offering snorkelling tours, you can just book directly with any of the shop/stalls, the itinerary of the tour are similar. 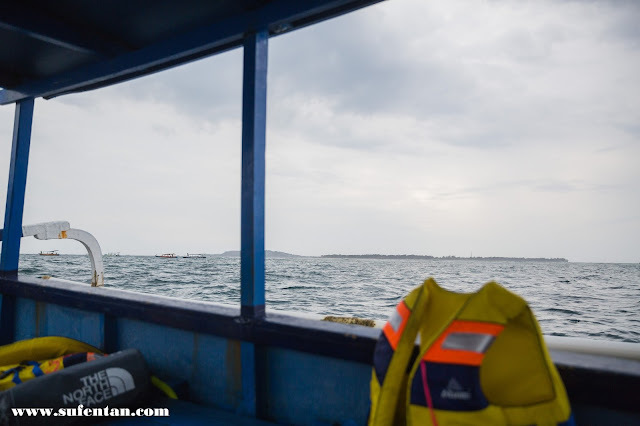 For 2-4 hours snorkelling with sharing boat, it costs around Rp. 100k per person. If you come in a group, you can hire a private boat for snorkelling around 4 hours for Rp. 200k per person. We managed to negotiate a whole day snorkelling trip (10 hours) for Rp. 2.5 mil (7 pax). We booked from ANDY booth. Staying in Gili T is very convenient as in every few steps you can find convenient shops, bikini shops and restaurants. Everything is just walking distance from one to another. 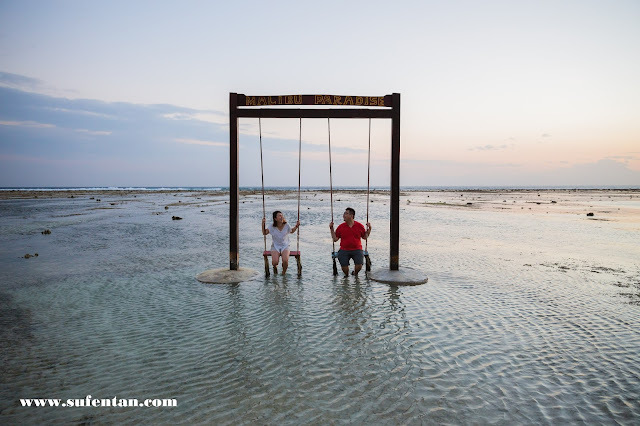 One of the attractions in Gili T is the swings on the sea. 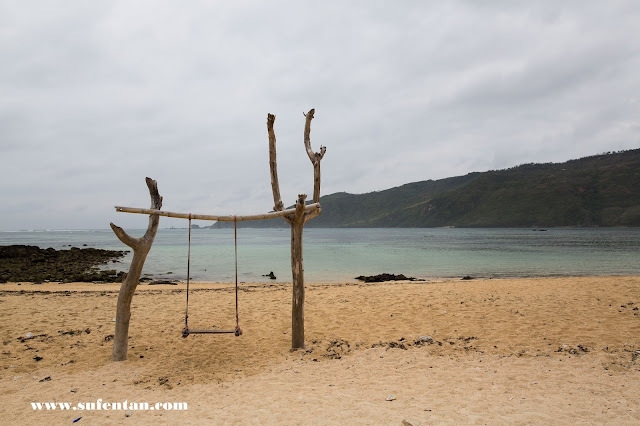 Ombak swing is the most favourite spot, situated at Ombak Sunset Hotel, however you may find a few other swings on the way to Ombak Swing. We did not manage to walk to Ombak swing as it was way too far and we spent a lot of time taking pictures. But we managed to capture the beautiful sunset by the beach. The best time for photoshoot and poses! We found an empty land when walking back to the harbour street and started to play with some lights. 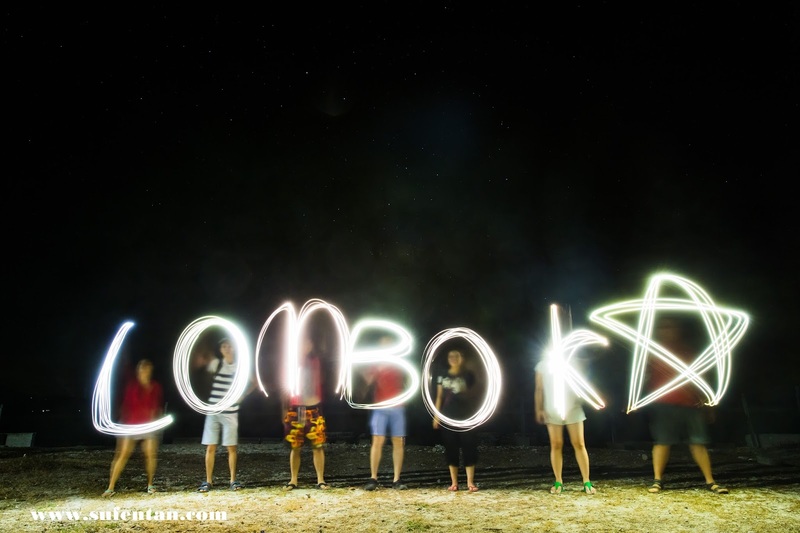 At night in Lombok, it can be really dark, be prepared with your phone light. Located along the main street. 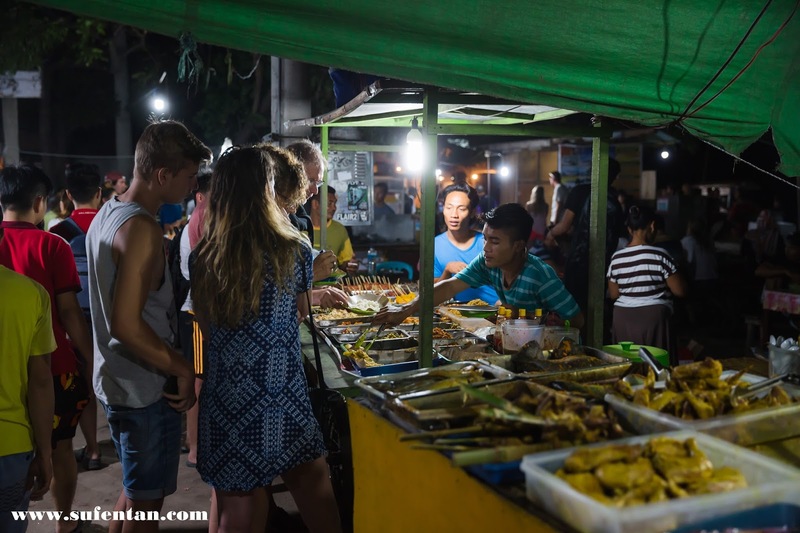 The night market are different from what we have in Malaysia. Mostly are stalls selling Mixed Rice (Nasi campur) and Grilled seafood. 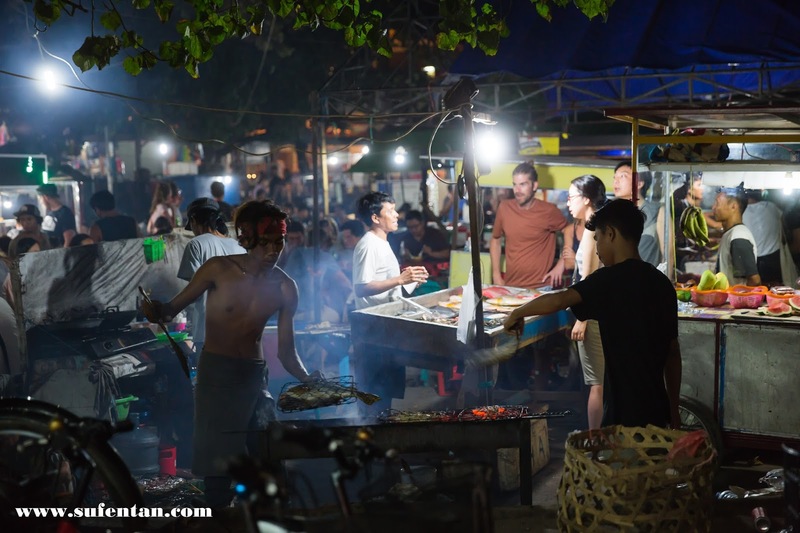 We did not try anything from the night market as we found the seafood wasn't stored under the correct temperature to retain the seafood's freshness. Just to avoid anyone getting food poisoning during the trip. 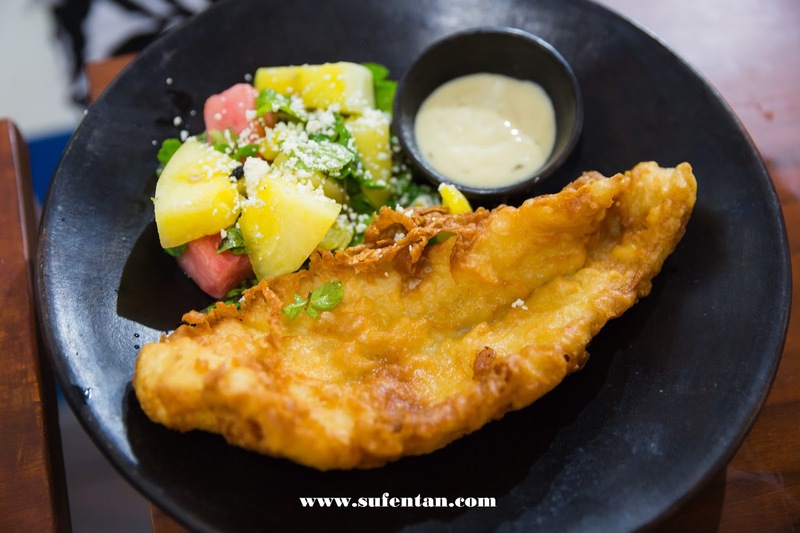 Pick the fish and they will cook for you. We started our day as early as 9am. The tour included snorkelling gear, however if you are concerned about hygiene, you may bring your own gear. Lombok is famous for the glass bottom boat where the bottom of the boats are built with glass where you are able to see underwater directly from the boat. We are lucky that we spotted a turtle and managed to capture a photo of it before a swamp of people pushed us away while trying to touch it. Please don't harm any sea creatures if you see any! And who said turtles are slow? They swim quite fast and we couldn't catch up as we were not wearing flippers. 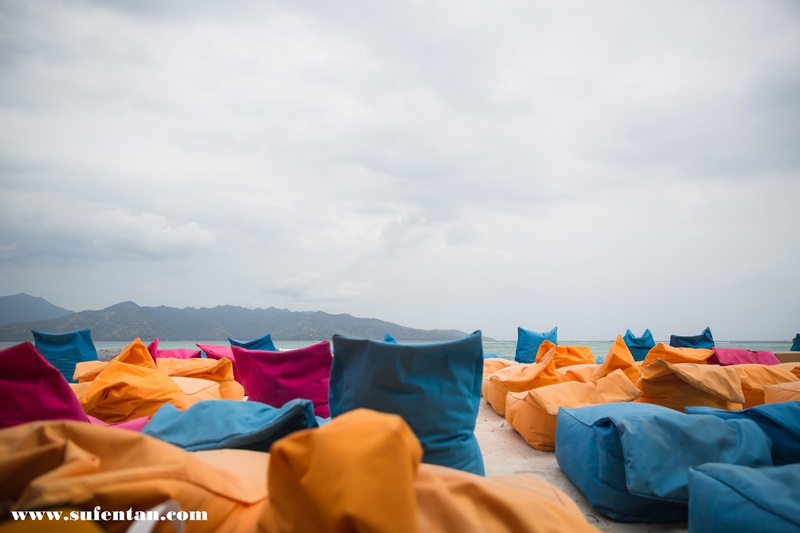 After our lunch, we spend some time exploring Gili Air and found some bean bags in front of a resort. So, we just chilled out and relaxed there by ordering drinks as we are using their bean bags. If you opt for 4 hours trip, the trip ends around noon after lunch. But we continued another 3 spots near Gili Meno. We were told to see some baby turtles on the beach. Here we are at Gili Meno Turtle Santuary. 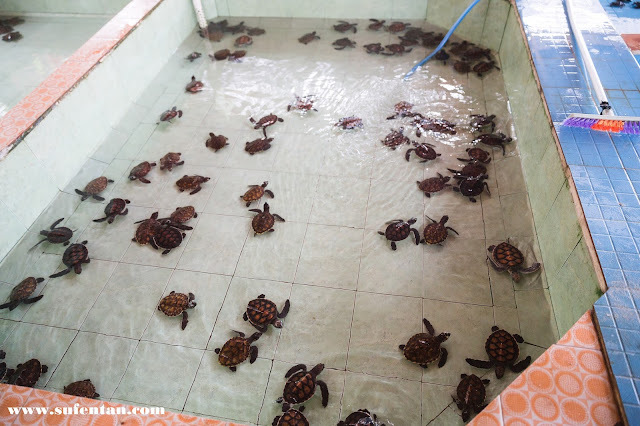 You may donate Rp 100k to help to feed those baby turtle. They have some care takers to look after these baby turtles. 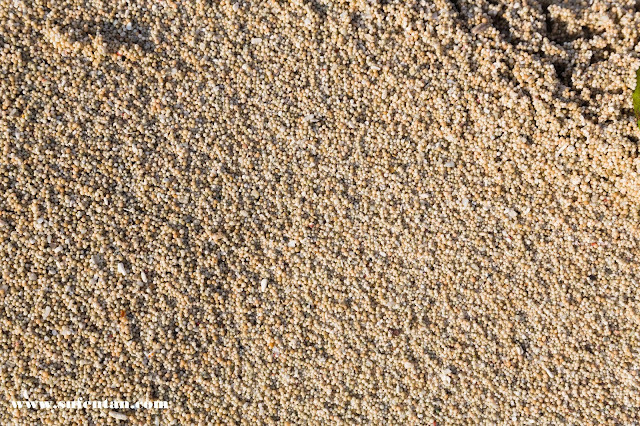 Baby turtles will be released to the sea when they are 8 months old. 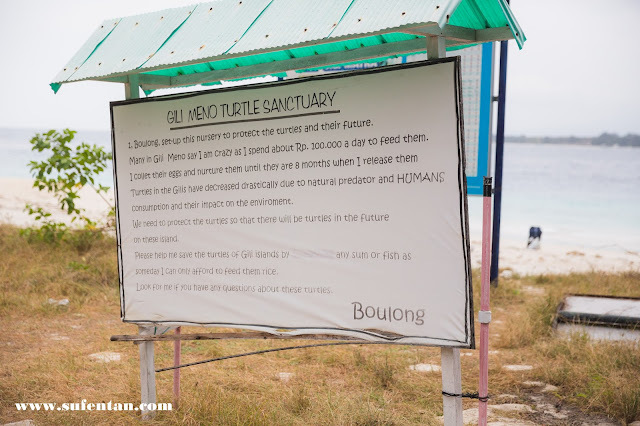 You may also find turtle santuary in Gili Trawangan as well. We ended our snorkelling trip around 5.30pm since the weather wasn't promising, we were unable to see any sunset on the way. 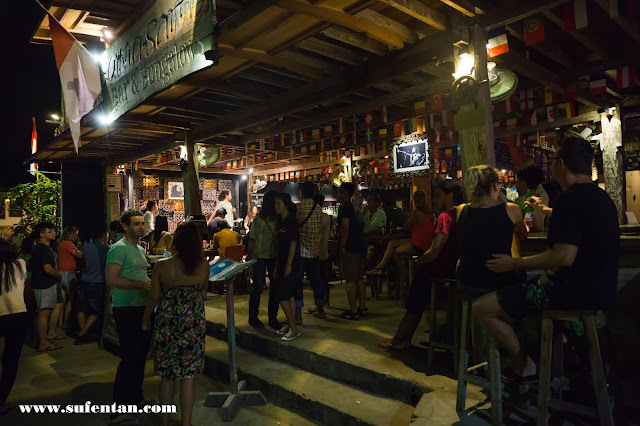 If you like to have a drink and dance all night, Gili Trawagan has many pubs that you can hang out. It is the happening island! The later the night goes, the louder the music went. If you like to have a quiet night's sleep, choose the hotel/guesthouse that is far from the pubs. 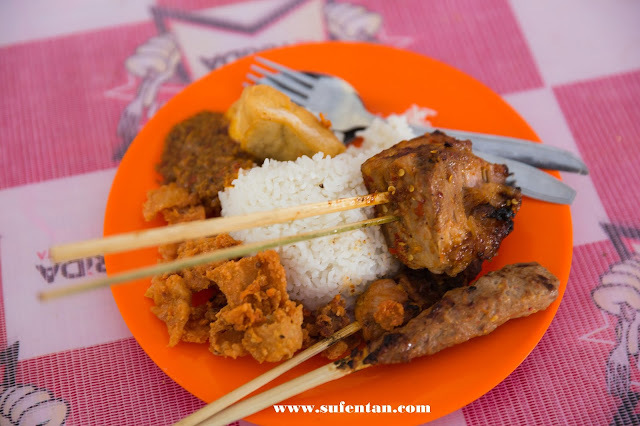 You will also find small stalls selling snacks like fried tofu, satay and nasi campur along the street. 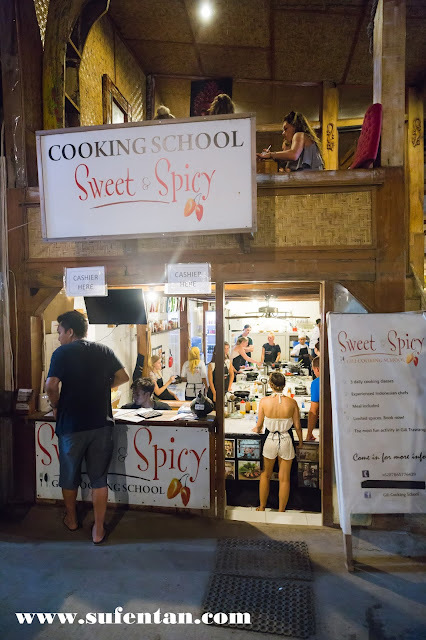 If you would like to learn some Lombok dishes, you can join the Sweet & Spicy Cooking class. It is a 4 hours masterclass starting from Rp. 330k per person. 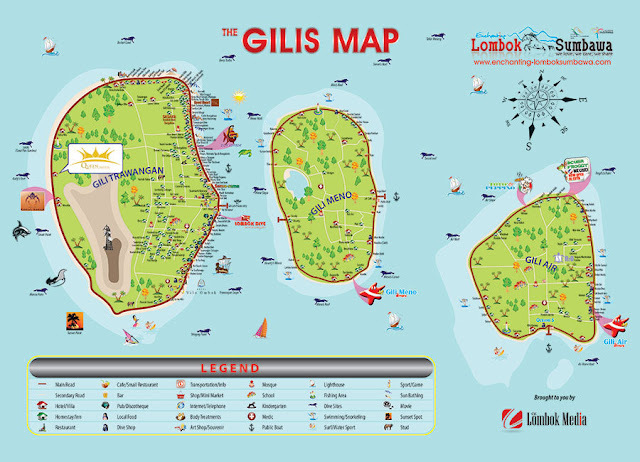 After breakfast, we depart from Gili Trawangan to Lombok land for our South Lombok Trip. Eko-our tour guide picked us from the harbour. 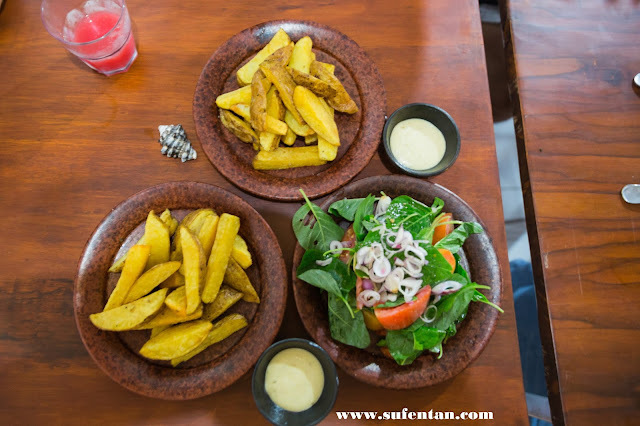 In between our journey, we stopped by a few places for shopping, lunch and snacks. 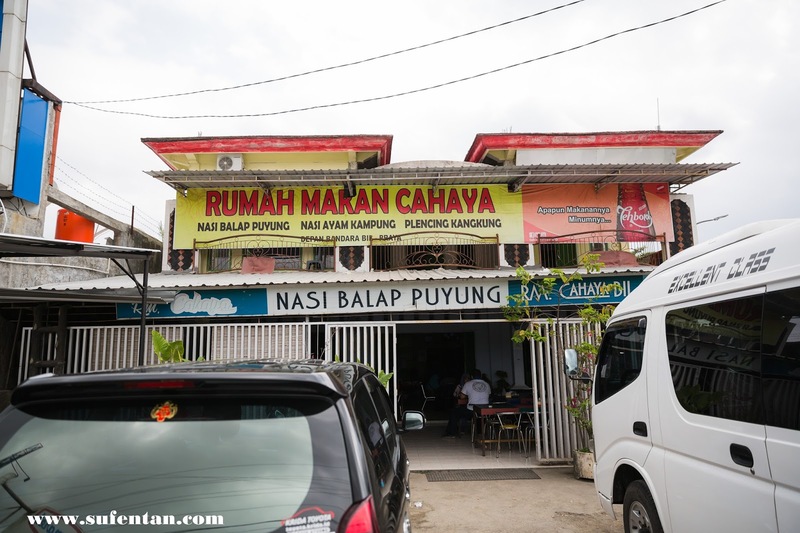 Our first stop- Pusat Oleh-oleh, the place to shop for souvenirs. You can buy cheap key chains and fridge magnets here compared to those stalls selling in Gili Trawagan. We went to a local snack shop to buy some local snacks. I didn't manage to take any photos as all of us were busy tasting the snacks and shopping. 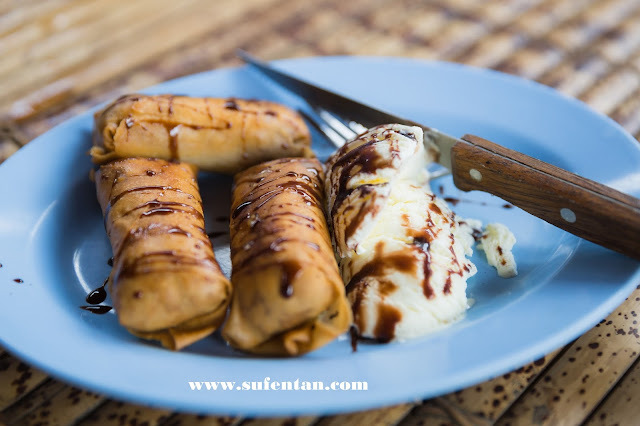 Lombok is famous for the dodol but I do not really like it as it is hard and sweet. Here are what I bought! 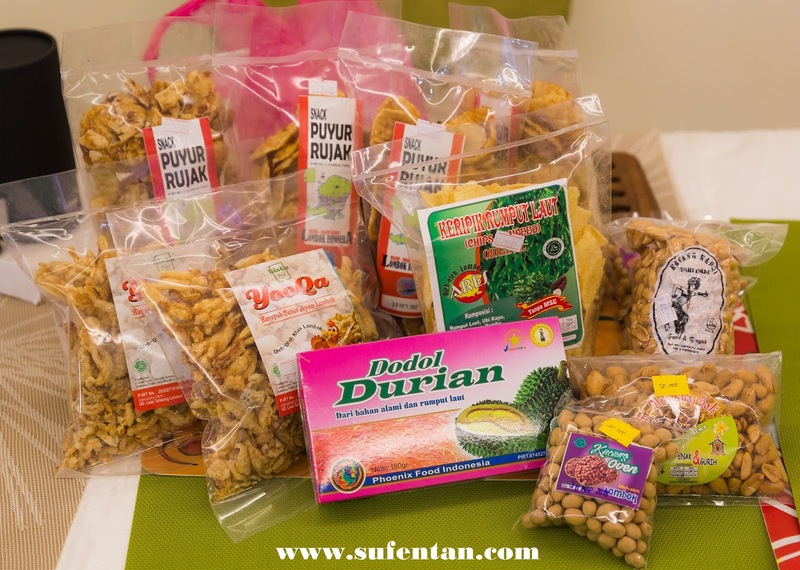 I really like the Keripik Rumput Laut and the peanuts. Basically a shop that sells clay wares. They are a lot of variety from big vases to the smallest tea pots. However the price doesn't come in cheap as well. 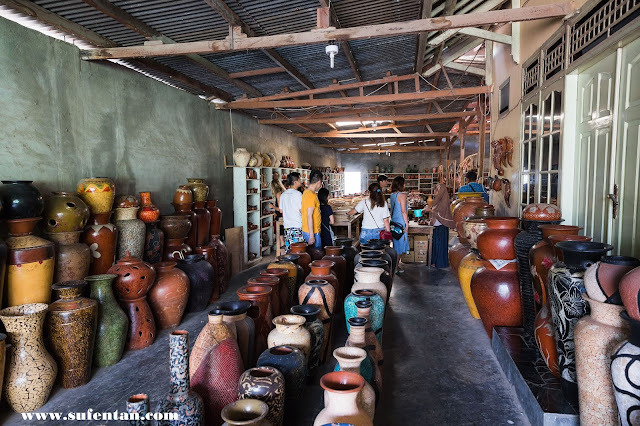 Behind the shop, there is a workshop area where you can make your own pottery. If you would like to bring home your master piece, just give them a small token of min Rp. 2000. Getting myself ready for the making. 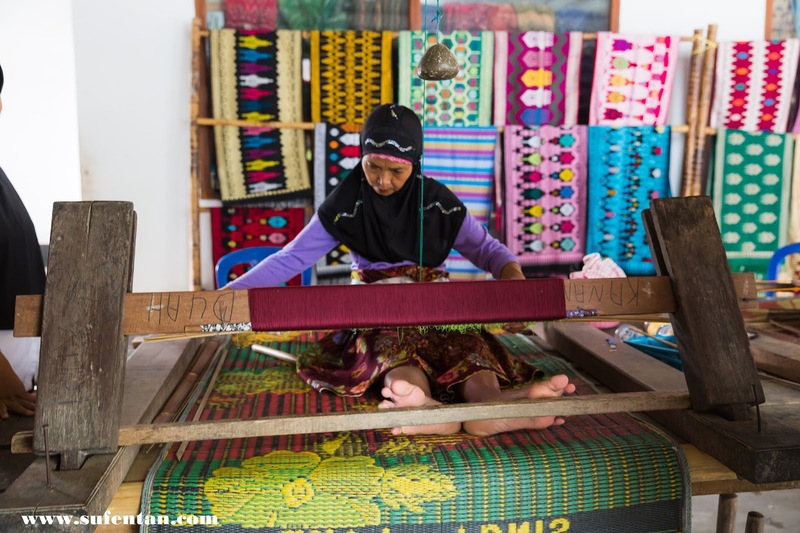 We initially thought it is a village full of people weaving but it was actually a shop selling their traditional weaving textiles. There are 4 persons outside the shop demonstrating the process. You can buy weaving textiles as souvenir. I bought a table runner around RM 150. 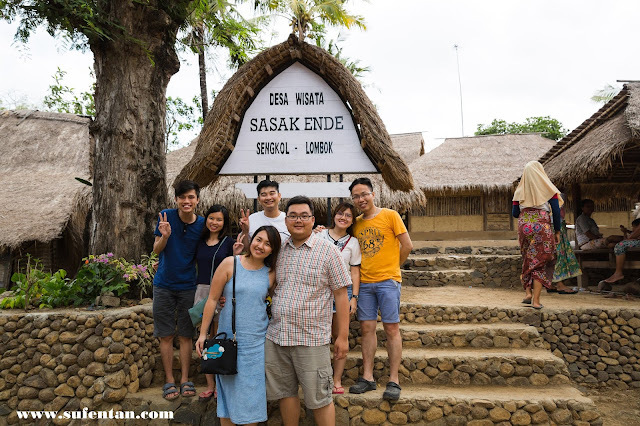 The place of the indigenous people of Lombok, they are called the Sasak people. 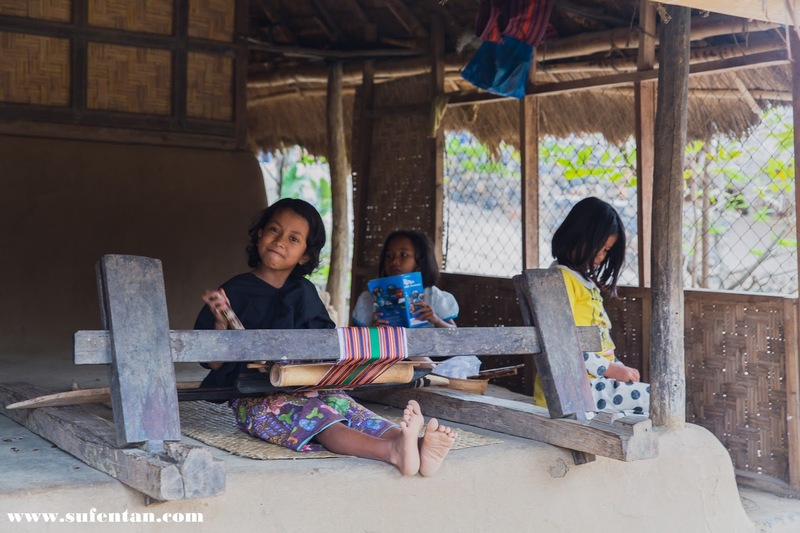 The place still remains in a traditional lifestyle. 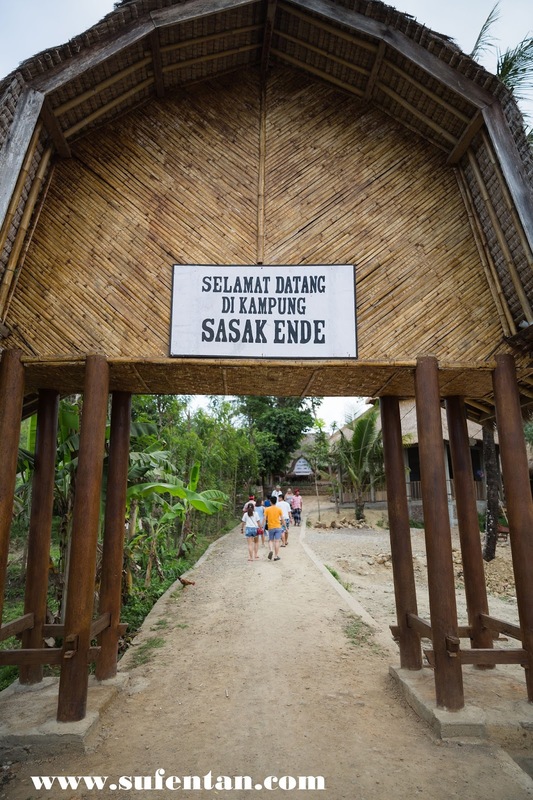 The Sasak people are still living there although it is open for tourists to visit during day time. 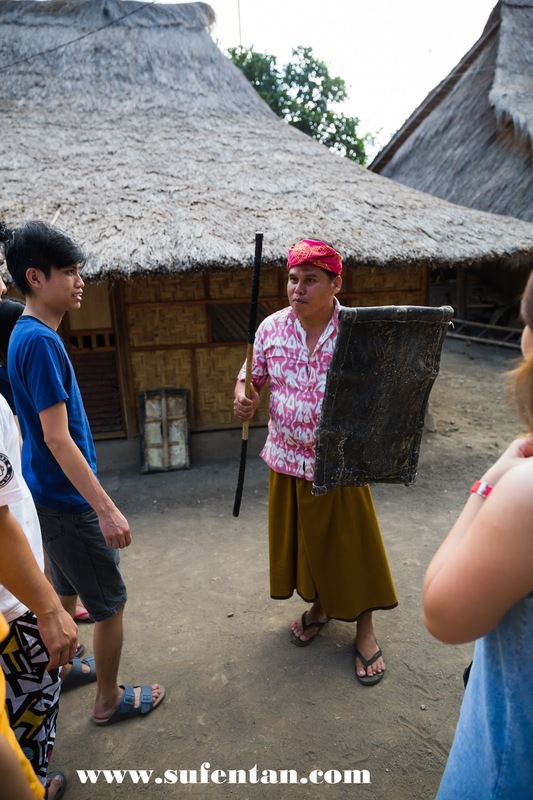 Their own tour guide will guide you around the village and you will need to donate to them of any amount. 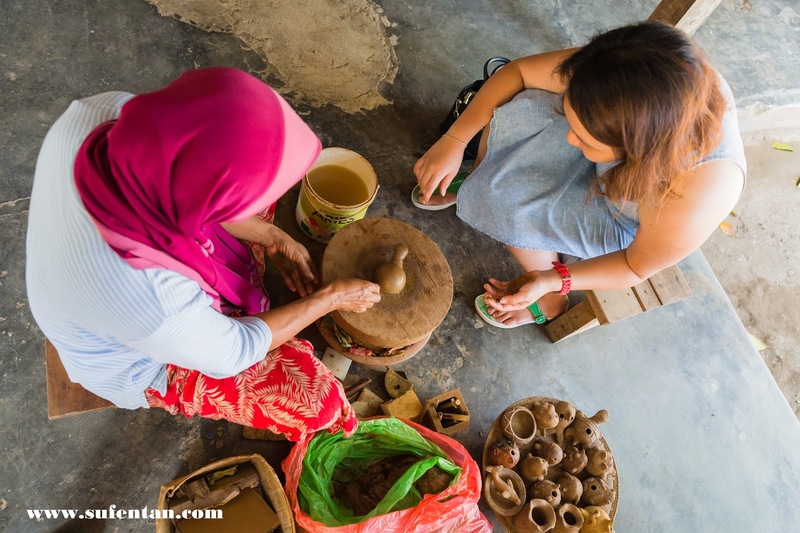 All the houses are made from clay and cow's poo. Every year, the woman will use the cow's poo to repair cracks in the house. 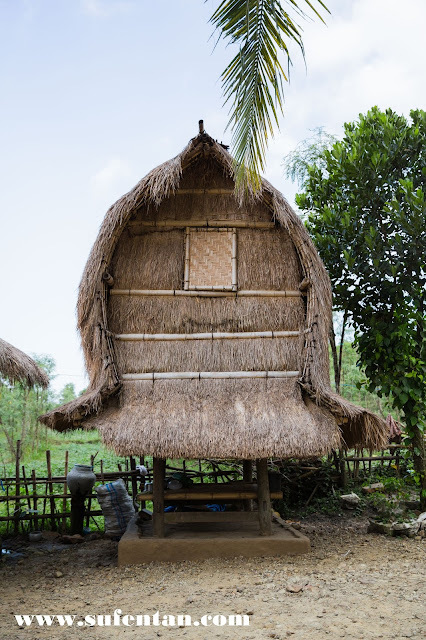 Each house depending on sizes, can stay at least 5 people to 9 people. Men & women will sleep separately even after marriage, except when they would like to have babies. 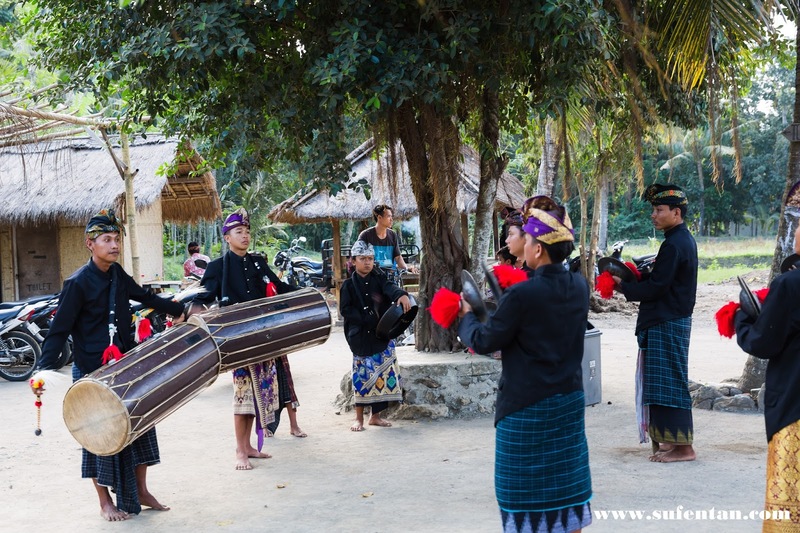 Until now, the Sasak people are still practising this tradition. Young girls learning to weave. 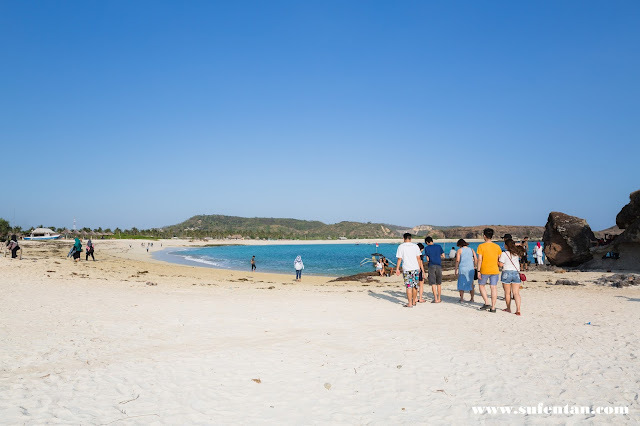 Tanjung Aan beach is a unique beach where the sand has two colours on the same beach. It is a soft beach with rounded sand. 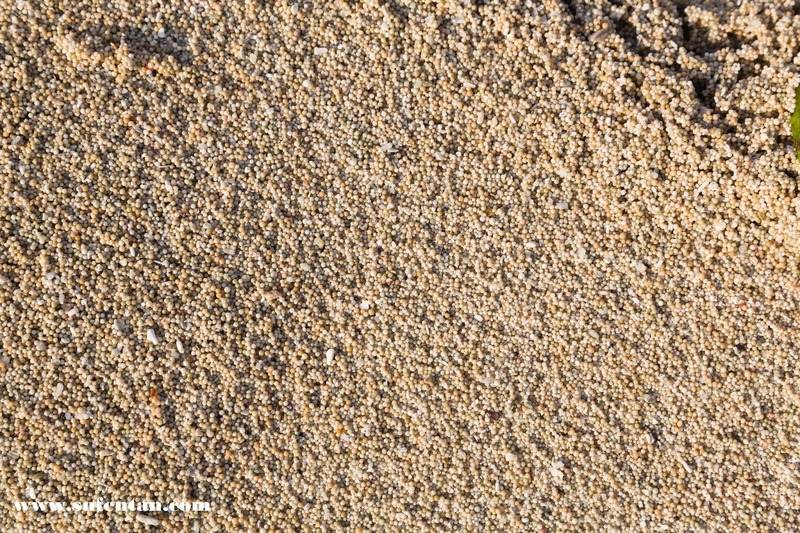 The shape of the sand is round, you wouldn't feel a sharp edge poking at your leg while walking on the beach, but somehow, you feet will sink more than usual as opposed to a normal beach. 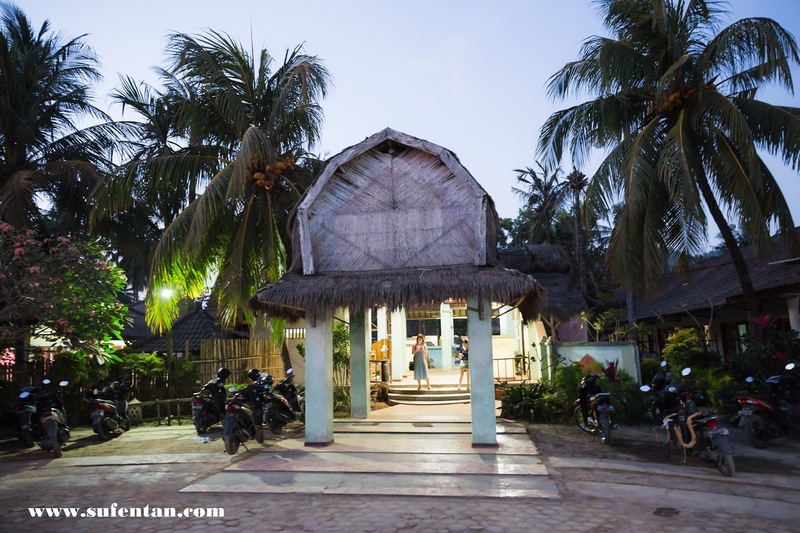 We stayed at Kuta on our third night. 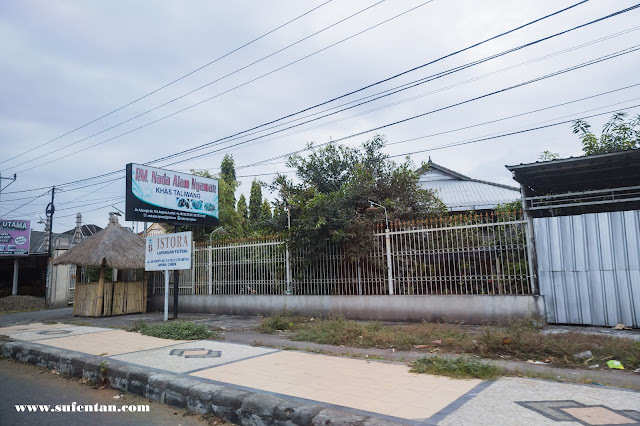 We booked Tri Putri Homestay however when we arrived, we were told the rooms have been overbooked. We were really disappointed toward the staffs' attitude as they lied to us that the room has electrical issues and they were unable to provide us the rooms. They claim to have prepared another homestay for us, but after a few rounds of questioning by us, they admitted that the rooms has been overbooked and they did not prepare any rooms elsewhere for us. 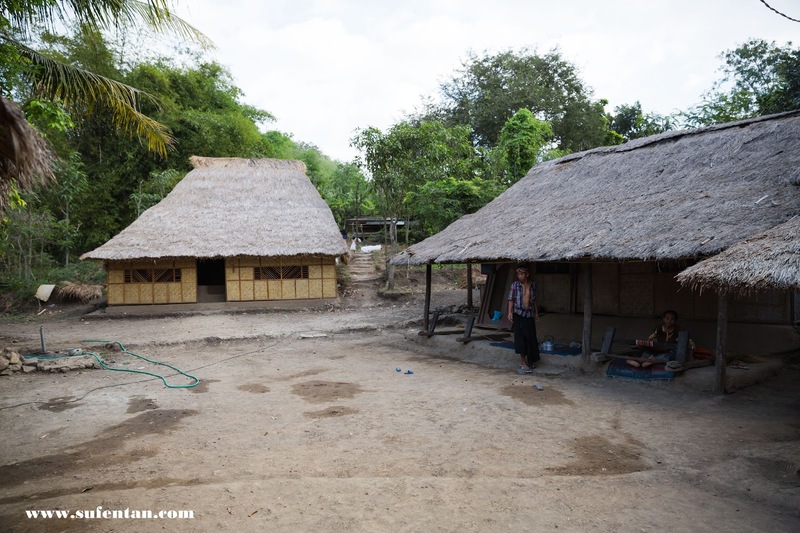 We were really angry as most of the hotels/homestay has been fully booked or overpriced. They drove us to every homestay to find available rooms and it was already late in the evening. Finally, we found some available rooms at Surfer Inn. 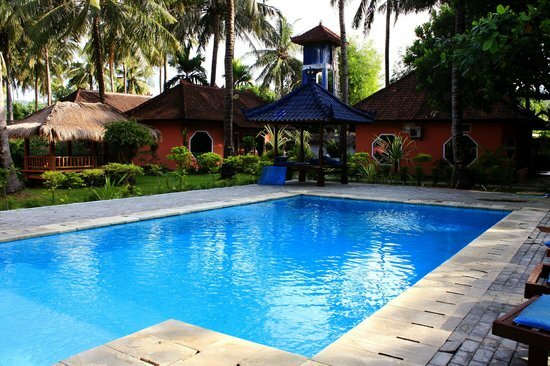 Surfer Inn-a very run down Inn that has a decent swimming pool in the middle of the hotel. Our rooms were still under renovation where the toilet's door were yet to be painted. We were unable to complain anymore as it was one of the best rooms available. We negotiated from Rp. 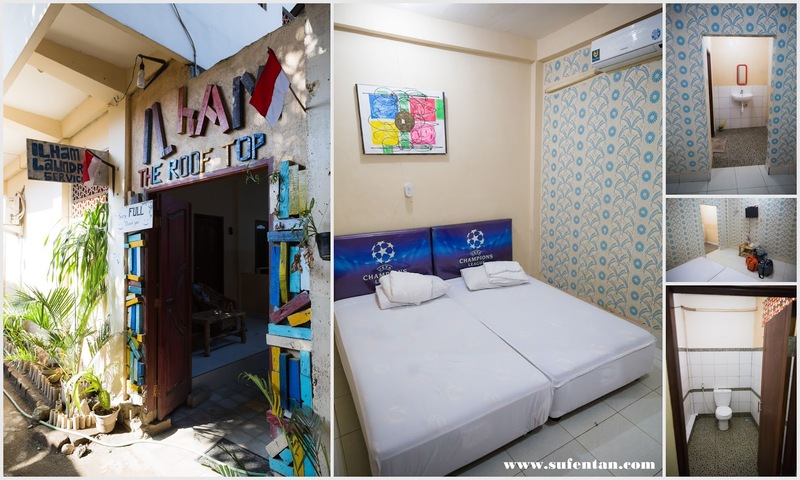 350K to Rp.250K, A/C room with breakfast. I forgotten to take photos of the room as we were tired finding rooms and the hectic argument with the previous homestay's staff drained our energy. Please take note if you want to take the risk to book with Tri Putri Homestay, it might ruin your holiday mood. 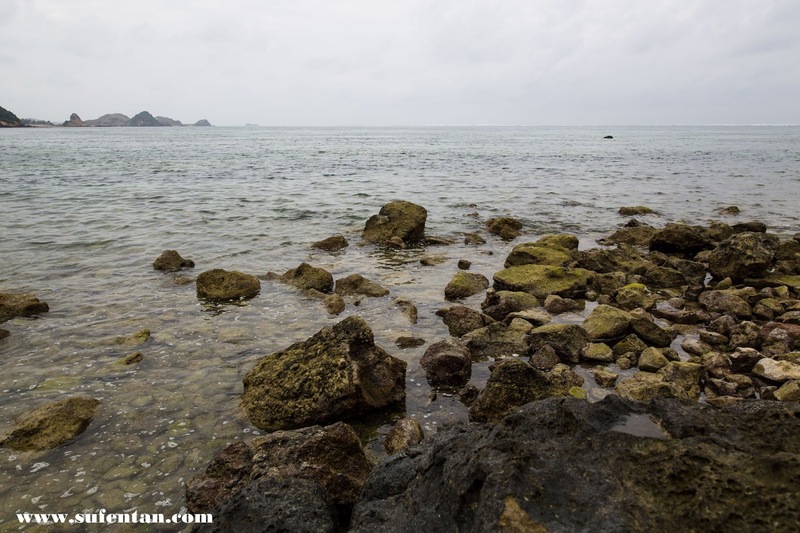 The next day before we depart to the airport, we went for a walk at Kuta beach. 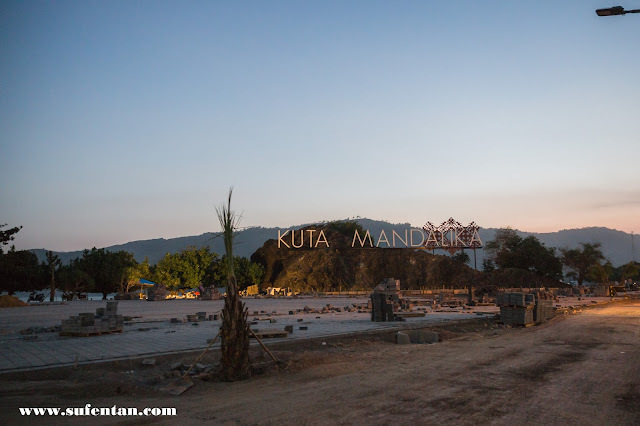 It is not as beautiful as Tanjung Aan beach but the whole main road of Kuta beach is under major construction. It will be very beautiful next year for Kuta area after the construction is completed. In total, we spent around RM 1000 each person including flight, accommodation, food and souvenir. 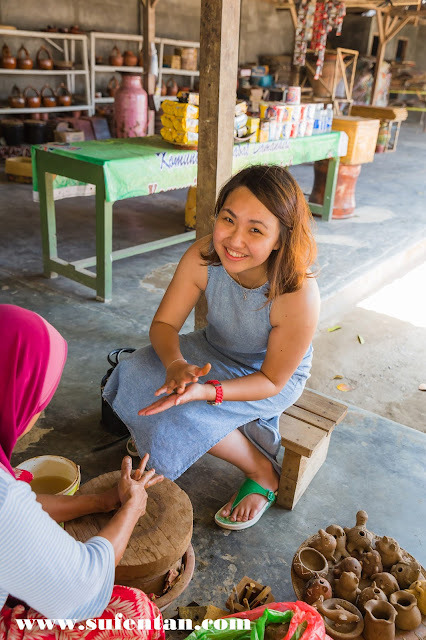 The biggest chunk was spent on the flight that cost us around RM 450 per person. 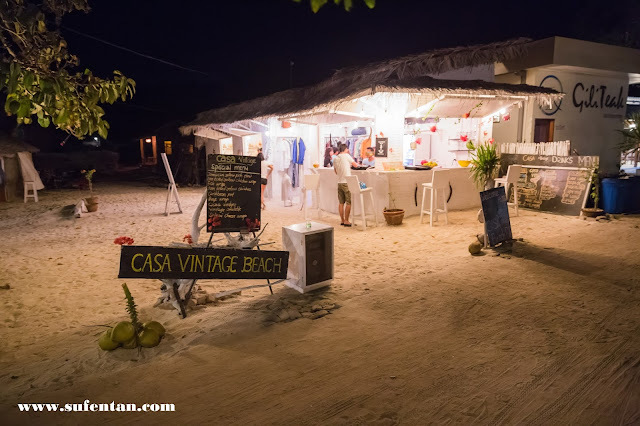 Overall we did not know what to expect when coming to Lombok but based on our experience here, Gili T is a nice place to stay but I would spend more on accomodation, and there were indeed many nice resorts on the West side of the island, where all the swings are located at. On a secondary note, Sengigi is a much quieter spot with some reasonable share of tourists around the area. 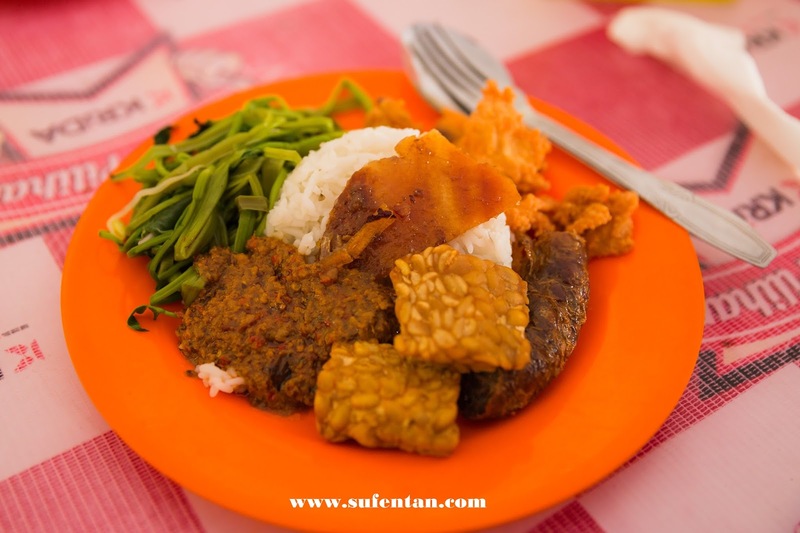 I would definitely try out Sengigi if we were to come to Lombok again.